Day 8 may be found here. I’m up at the crack of dawn. 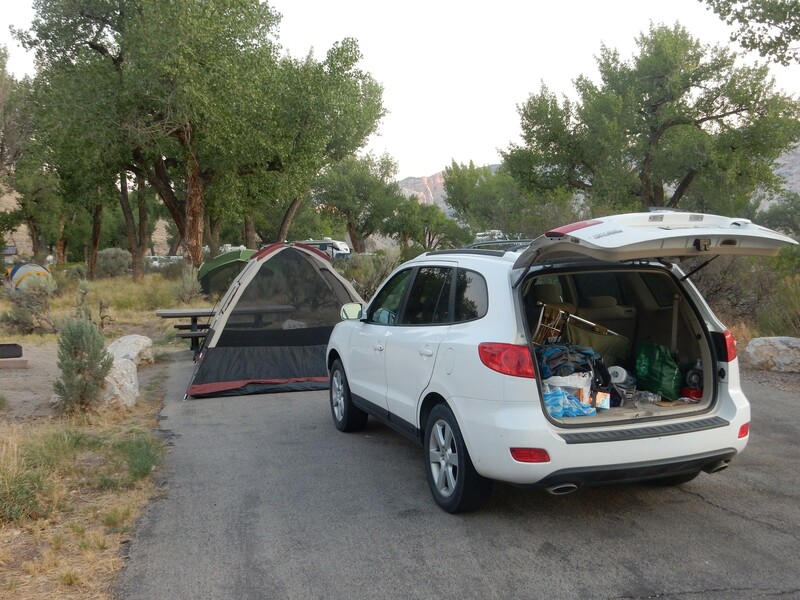 It’s a pretty nice campground, except for being a little buggy. The asphalt was a bit hard. The restrooms have actual plumbing. I suspect there are camper hookups, though I don’t generally pay attention to that. Haven’t been able to afford a solid-state tent yet. I cook my usual breakfast. The new red copper fry pan turns out to be very effective. (My opinion of it will only get better after I get home and start using it routinely in the kitchen.) Other than my air matress having a slow leak, I have corrected all the deficiencies in my camping loadout and should be good for the rest of the trip, other than resupplying perishables and the ice for my ice box for storing them. And my tire still looks okay; it maintained normal pressure all day yesterday. Something transient? I wonder about putting my pans down on the plastic faux-wood picnic table. Looks like someone else already did that. Either they were cooking with a cookie sheet, or their Coleman stove badly overheated. The nearby ridge is visible in the early morning light. The ridge is underlain by Pennsylvanian-Permian Weber Sandstone, about 300 million years old. 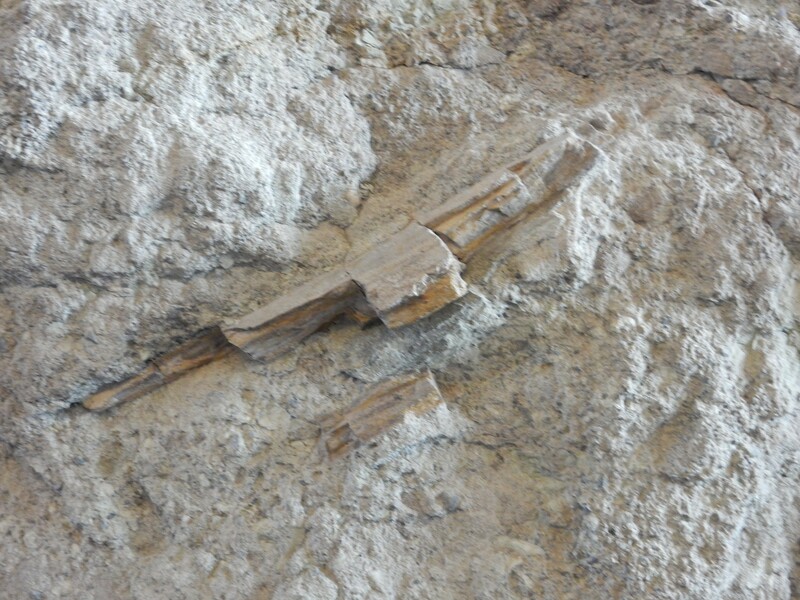 It is part of the southern limb of the Split Mountain Anticline. An anticline is where something warps the rock beds upwards, typically over an elongated area, which is called the axis of the anticline. (If the beds are warped up more or less symmetrically around a point, geologists call it a dome.) The limbs of the anticline are the tilted beds on either side of the axis of the anticline. It’s not uncommon for rock beds to undulate like waves on an ocean; the tops of the wives are anticlines and the troughs are synclines, with their axes more or less parallel. My campground is in the Jensen Syncline. 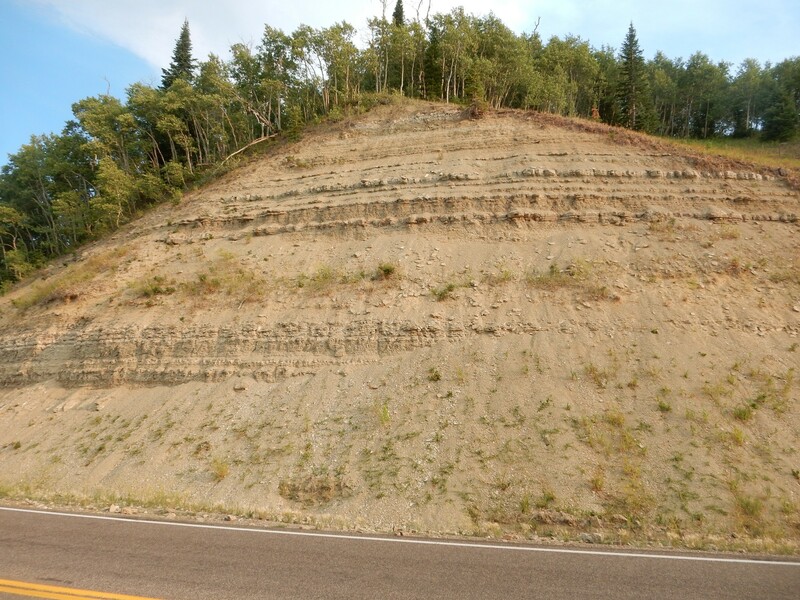 Erosion tends to bevel down anticlines, sometimes to the point where they do not show much of a surface ridge. 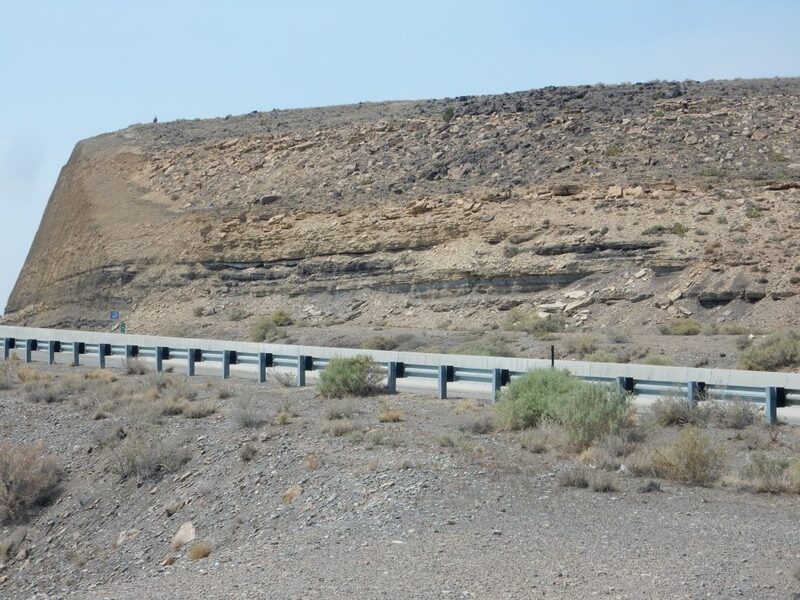 But progressively older rocks will be exposed as you drive or hike towards the axis of the anticline, whereas progressively younger beds will be exposed towards the axis of a syncline. You know you’ve crossed the axis when the order of the beds begins to play out in reverse. 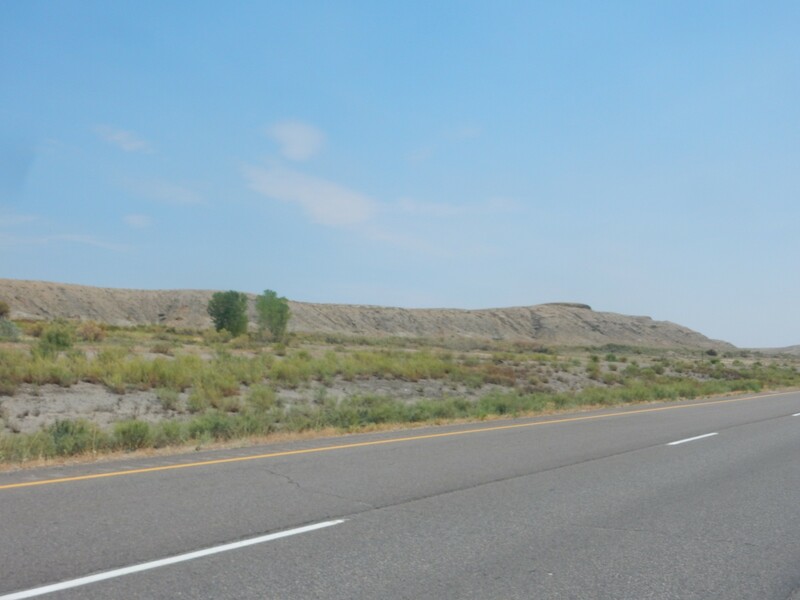 Bruce and I drove into the huge Uinta Anticline yesterday when we drove the “highway through the ages” north of Vernal, and we saw successively older rock beds. The air quality is still quite poor this morning. I pack and head out. 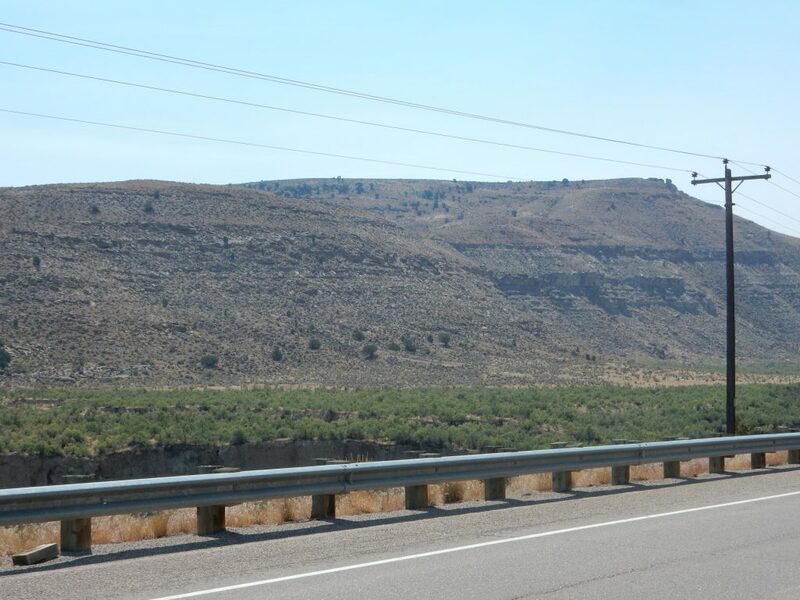 When I reach the plateau above the Green River, there is a spectacular view to the south. I get about another quarter mile towards the visitor’s center when I spot Bruce’s blue car pass me going the other way. We meet in a pullout and admire the scenery. However, I have to split the panorama to avoid photographing into the sun. 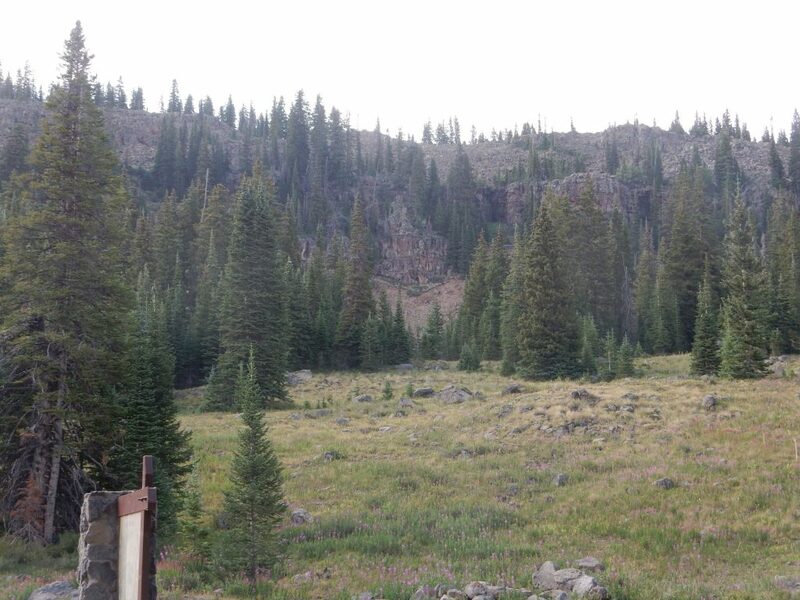 The ridge on the skyline at left in the second photograph is Cliff Ridge, which is another anticline (the Section Ridge Anticline) underlain by Permian Phosphoria and Park City Formations and Permian-Pennsylvanian Weber Sandstone. This illustrates the undulating rock beds of this area: the Split Mountain Anticline to the north, the Jensen Syncline I’m standing in, and the Section Ridge Antcline to the south, with both anticlines capped with Weber Sandstone and the syncline showing low exposures of much younger rocks like the Morrison Formation. The axes run east and west. 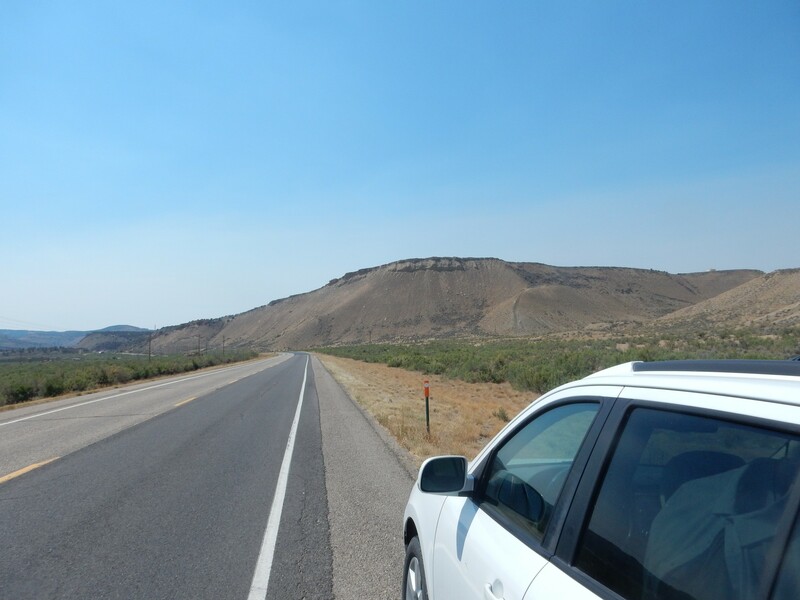 Here we are driving west between hogback ridges on the southern limb of the Split Mountain Syncline. 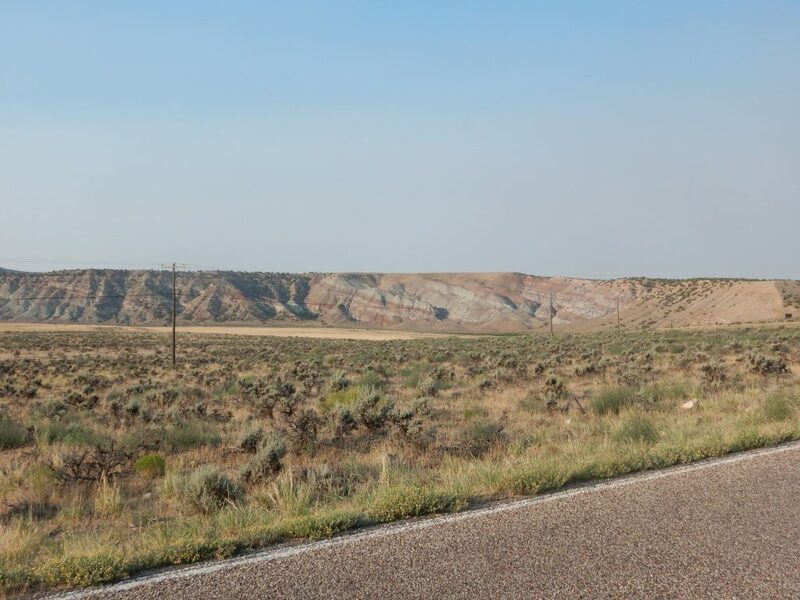 The valley between is eroded from less resistant beds of the Morrison Formation, the very formation where, in 1909, paleontologist Earl Douglass discovered an incredibly rich trove of dinosaur fossils. 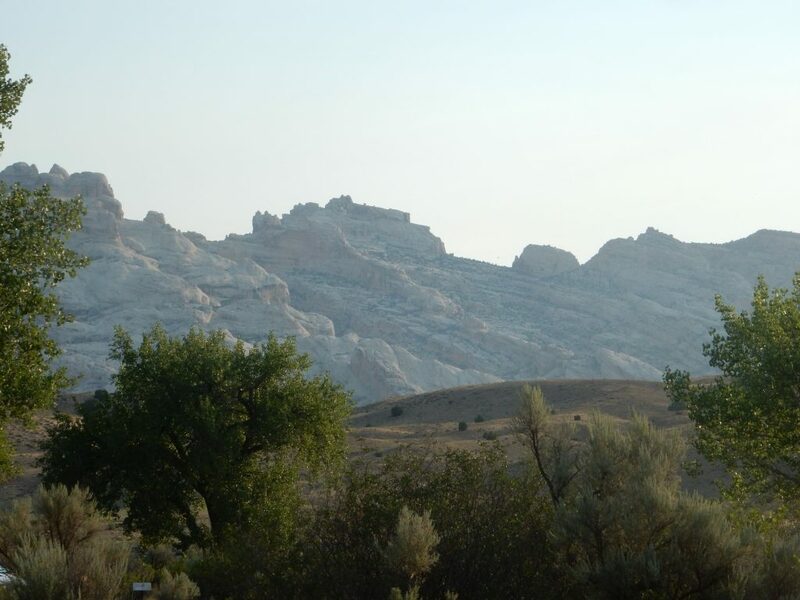 The Morrison Formation had first been characterized at Morrison, Colorado, in 1877, by Arthur Lake. The beds there became the focus of the Bone Wars, a long and bitter competition between early paleontologists Othniel Charles Marsh and Edward Drinker Cope. 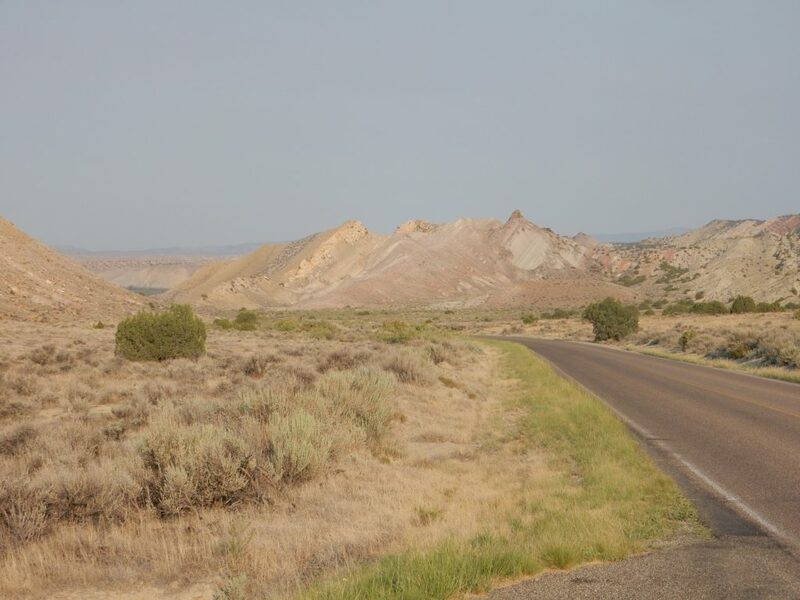 The dinosaur quarry is further up the valley at center left in the photograph, to the right of the hogback towards which the road appears to be headed. The bright bed at left is Frontier Formation. 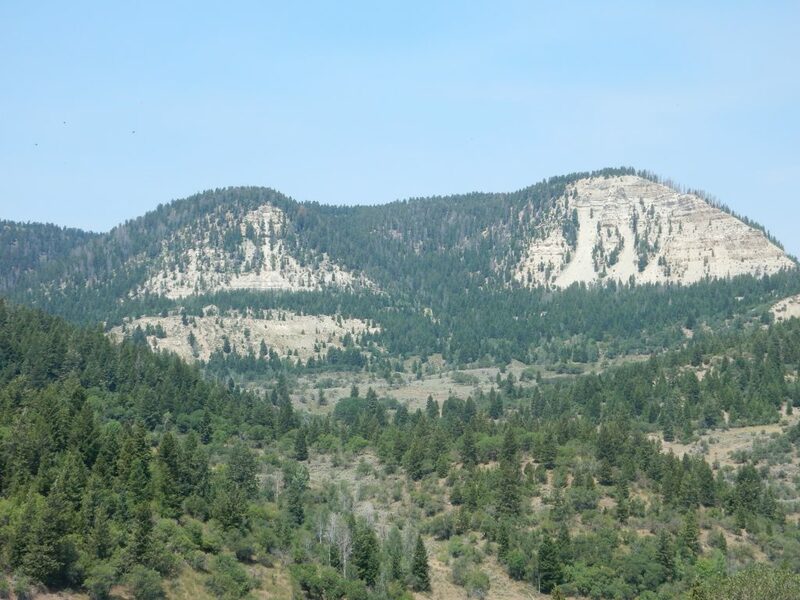 The notch is Mowry Formation, then a thinner white bed of Dakota, then Cedar Mountain and greenish Morrison Formation separated by a dark sandstone bed. I believe this is the level at which the dinosaur bones are found. We view the exhibits, visit the bookstore, and I find a good road map of Colorado. I’m looking over the other offerings in the bookstore when the call comes for the shuttle to the dinosaur quarry. We hurry out and take our seats. It is only after we are well on our way that I realize that, in the rush, I walked out of the bookstore with the highway map without paying for it. Shucks, and other comments. My skin will be crawling from this point until I get back to the bookstore and pay for the map, which takes just a little of the joy out of the visit. 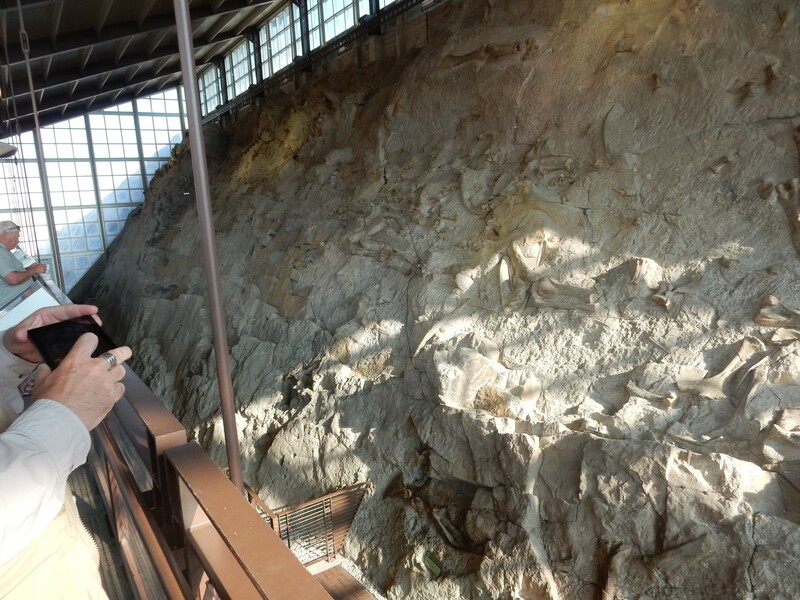 Which is too bad, because the quarry is one of the coolest things I’ve seen the Park Service do. That’s Bruce in the foreground. 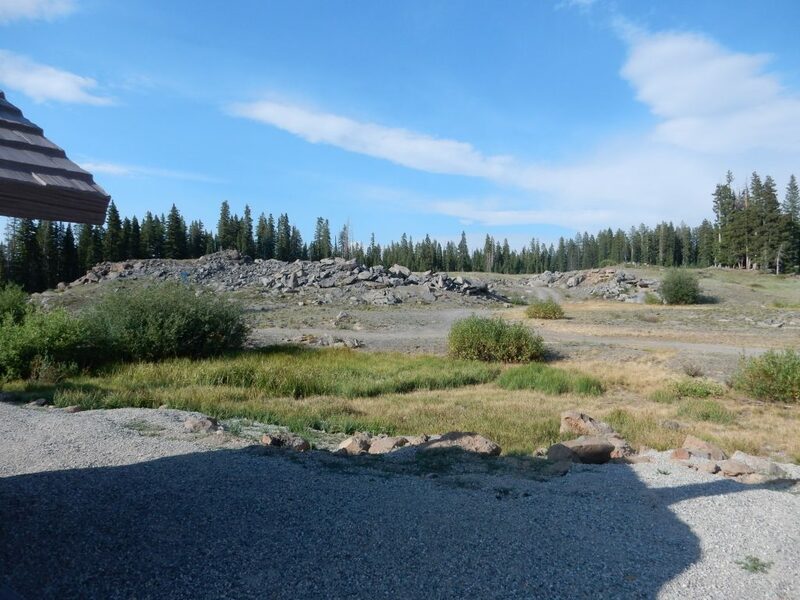 The building in the background is built over the remaining beds of the quarry, so that you can see a large collection of partially exhumed dinosaur bones in place. 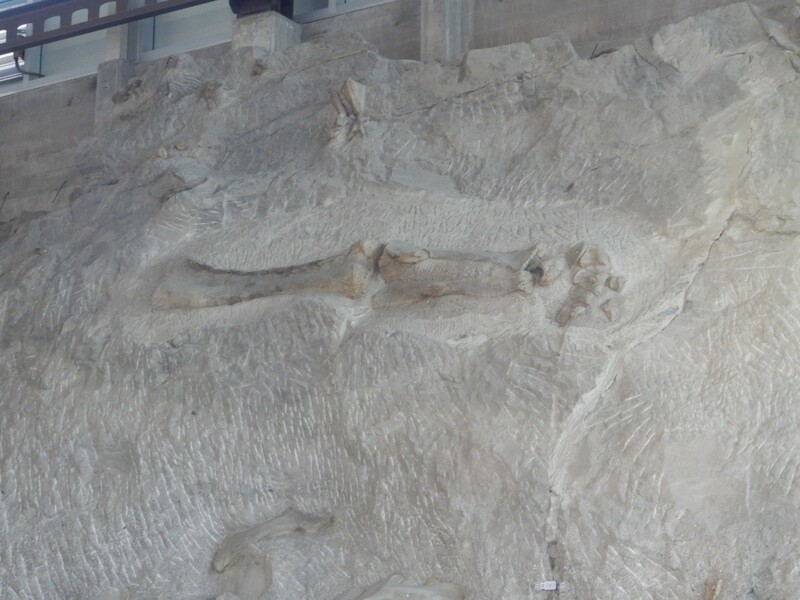 It represents about a quarter of the area of the original bone beds; the reset were all excavated and thousands of fossils shipped off to museums. In fact, they have display cases with some flora fossils, just to show you what they might be like. Also a complete Allosaurus skull, which I did not think to photograph. 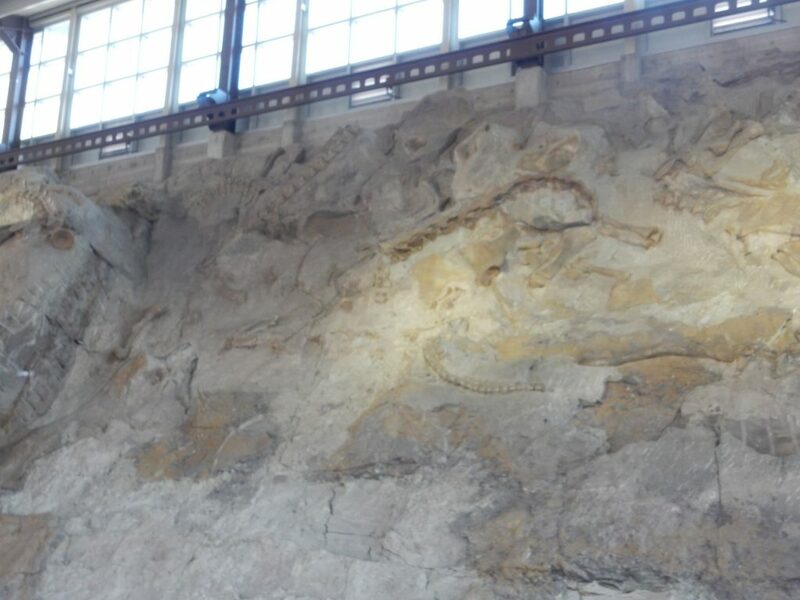 We meet a ranger who has become very interested in paleontology since being assigned to Dinosaur National Monument. She explains that the depositional environment was high-energy, meaning, lots of rapidly running water, so that smaller fossils were washed away and larger ones pulled apart as the flesh rotted. She also pulls out a stratigraphic column, which she describes as a “stratcom”. I am amused; STRATCOM means something rather different in my world. Besides being a font of knowledge himself, Bruce has the credentials to get other experts talking whom we meet. We return to the park to await the shuttle. I get a panorama. 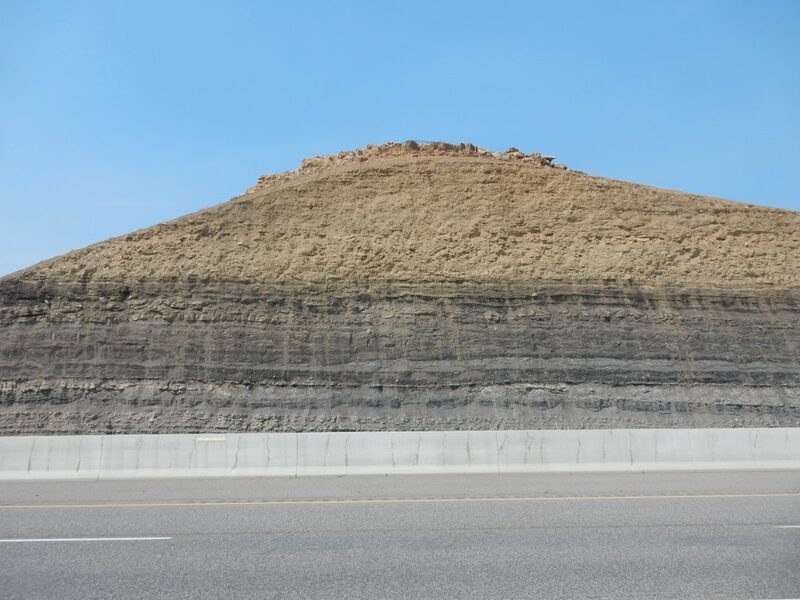 Try to imagine what it was like before three-fourths of the fossil ridge was quarried away. I’m going to rant for just a moment, and it’s going to have political overtones. Feel free to skip the next couple of paragraphs. The Supreme Court has repeatedly ruled that the authority given the President by the Act is so sweeping that it’s essentially impossible to challenge any new monuments or extensions to monuments on the grounds that they exceed the miminum necessary area needed to protect known “objects.” And, from a strictly legal perspective,that may be right. But I hope that, regardless of how you feel about a particularly President or a particular monument; or whether the Act should be interpreted to allow the President to remove a designation (we’re apparently about to find out); or even whether you have any problem with Presidents setting aside all the public land they like; that you can see the hazard, in general, of Congress giving sweeping authority to the President in this or that matter. The Founders meant the President to be the servant of Congress, and not for Congress to be his rubber stamp. I’m wishing (but, honestly, not hopeful) that one good thing that will come out of Trump’s election is to persuade Democrats that perhaps it really would be a good thing if Congress reclaimed some of its authority from the President, and the states from Congress. Not just when Republicans are in office, but permanently. When we get back to the headquarters, I beeline to the bookstore, grab an additional book I was thinking of buying (as penance, you understand) and purchase it and the Colorado highway map I thoughtlessly (and quite innocently) walked off with. The book is Ancient Landscapes of the Colorado Plateau, a book of paleogeography (geography in the distant past) that is excellent. There’s a copy in my local library, but I like it so much I want a copy of my own. Bruce and I consult over my new map and his extensive collection of large-scale maps. (They’re wonderful, but a touch unwieldy, since each page is such a small area.) 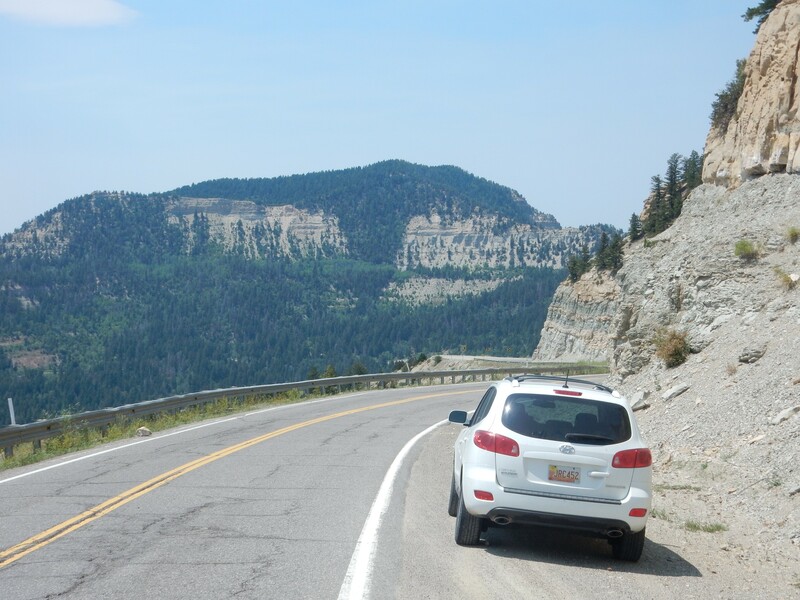 We decide to get to Grand Junction via Douglas Pass, which is slow but beautiful. I take the lead in my car again. Our first stop is south of Cliff Ridge. Remember the earlier discussion of how the rock beds undulate through this area, with alternating anticlines (upwarps) and sycnlines (downwarps)? 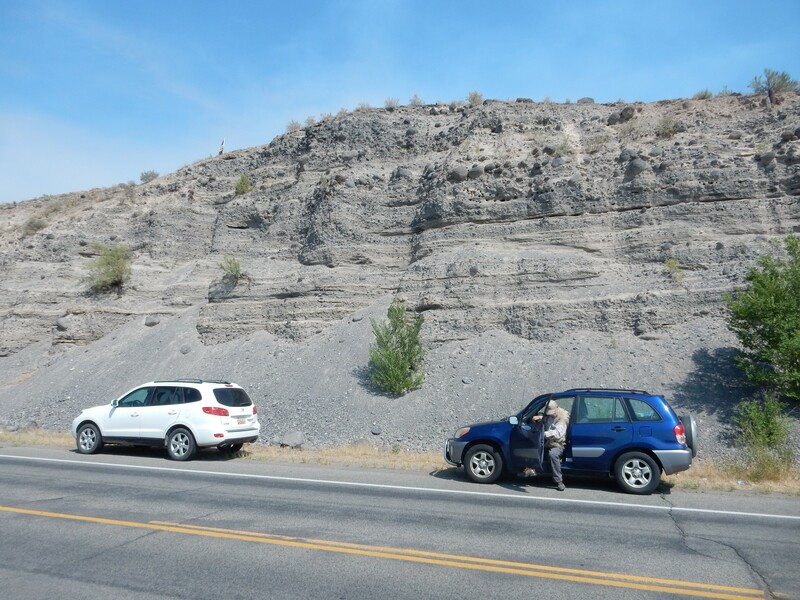 We’re now in the Walker Hollow Syncline, and just a short distance south of us is a major thrust fault, a break in the Earth’s crust where younger beds are forced over older beds due to compression of the crust. Almost all these structures, like most structures associated with the Rocky Mountains, date back to the Laramide Orogeny, a period of mountain building which peaked around 60 million years ago. (No pun intended.) This was caused by the west coast of North America coming up against the East Pacific Rise, a great upwelling in the Earth’s mantle. The oceanic crust on the east side of the Rise, the Farallon Plate, subducted under the west coast of North America. Subduction is a common enough occurrence (it’s happening now along South America, the Pacific Northwest, Indonesia, the west coast of South America, under Japan, &c, , &c.) but the subduction of the Farallon Plate took place at an unusually shallow angle. This may be because the Farallon Plate was unusually thick and buoyant due to an old mantle plume erupting thick lava flows on the plate. Whatever the reason, the shallow subduction crumpled up western North America like an accordion. North America is now drifting onto the East Pacific Rise itself, which is simultaneously uplifting the entire western United States and pulling it apart. 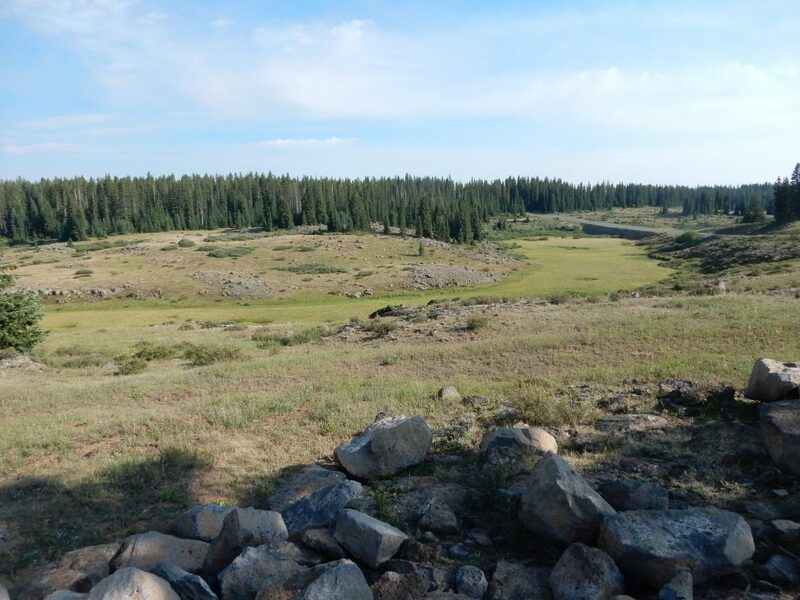 This has done a great job of exposing a long geologic history through erosion of the beds. 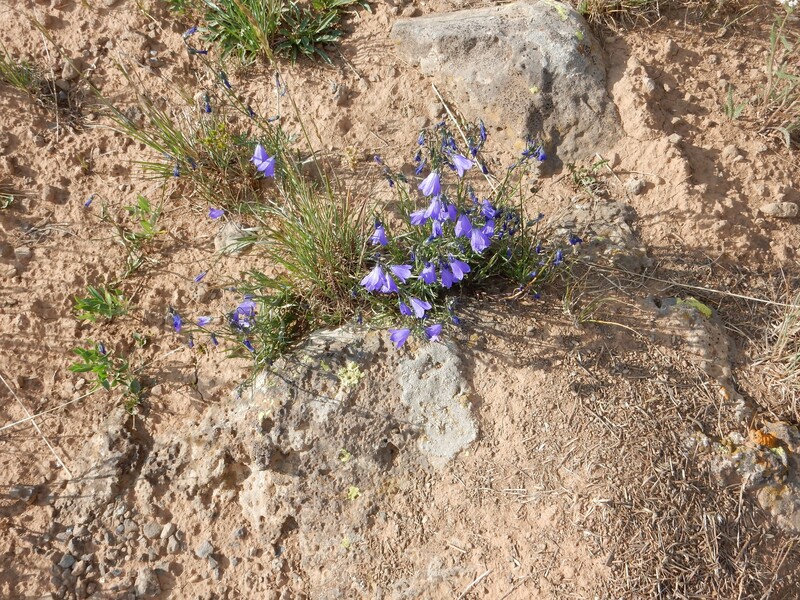 Alas, the erosion will eventually destroy the beds, including some over a billion years old. It seems kind of sad. The valley, and associated highway, cut through a hogback: The Mesaverde Group. The Mesaverde Group goes back to the Cretaceous, when a shallow sea, the Western Interior Seaway, lay east of the Sierra Nevada and extended nearly to what is now the Mississippi Valley. This sea retreated briefly from much of western North America, leaving a regression-transgression sequence. This began with a layer of beach sand, then river and swamp deposits behind the beach, then another layer of beach sand as the sea returned. Above and below are marine shale beds. 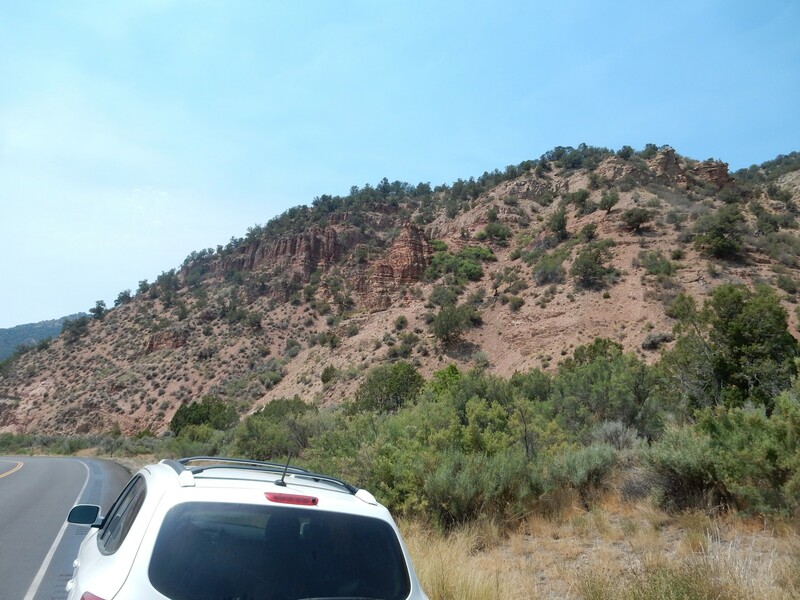 Back home, this sequence is pretty clear cut west of the Jemez, with the Point Lookout Sandstone being the first beach sand layer, the Menefee Formation with its coal beds being the swamp layer, and the Cliff House Sandstone forming the second beach sand layer. Here the road cuts through the hogback. While the Mesaverde Group is mapped throughout much of the West, it has different local names for its component formations in different locations. The map does not distinguish, but mentions the Sego, Castlegate, and Rim Rock Formations as likely local units. You can see a bed of almost pure sandstone at left, representing the final transgression, and beds rich in organic matter (though not quite coal), but the lower sandstone is missing. This ridge is known locally as Snake John Reef. Back home, a more likely name would be San Juan Ridge. “Reef” in the language of Western pioneers meant a sharp ridge that posed an obstacle to travel by wagon, the way a reef in the ocean poses an obstace to travel by ship. We enter Colorado and pass through Dinosaur, turning south towards Rangely. Utah has a superb online interactive geologic map (with some gaps). Colorado is a big tricker; I have to look up the quadrangle and search for that map at the USGS web site. We stop at some spectacular level exposures of upper Mesaverde Group. These cap the mesas to the south. I have no idea of its exact taxonomy, but I found it striking. We are about to enter the Rangeley Oil Field, and the satellite view shows numerous well pads. Oil is formed from waxy remains of ancient plankton (kerogen) preserved in marine sediment beds, often of limestone or shale (the source rock.) 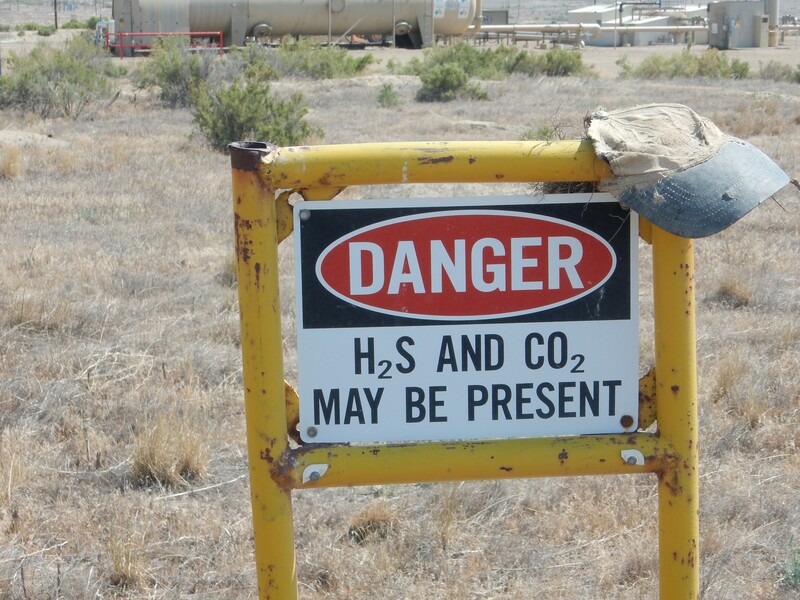 When buried deeply enough to be heated — but not too hot — the kerogen produces petroleum. This rarely remains in the source rock, tending instead to migrate upwards, since it is a light fluid. It is trapped by impermeable beds such as dense limestone or shale (trap rock), accumulating in porous formations (the reservoir rock) under the impermeable barrier. Petroleum then usually flows along the lower surface of the trap rock until it finds a further path upwards, eventually reaching the surface and oxidizing in the air. Such oil is wasted, from our point of view; at best, it produces low-value asphalt. The petroleum we covet is found in traps where the structure of the beds keeps the petroleum in place in a reservoir bed. For example, the crests of anticlines represent high points in the beds, where oil can be trapped. 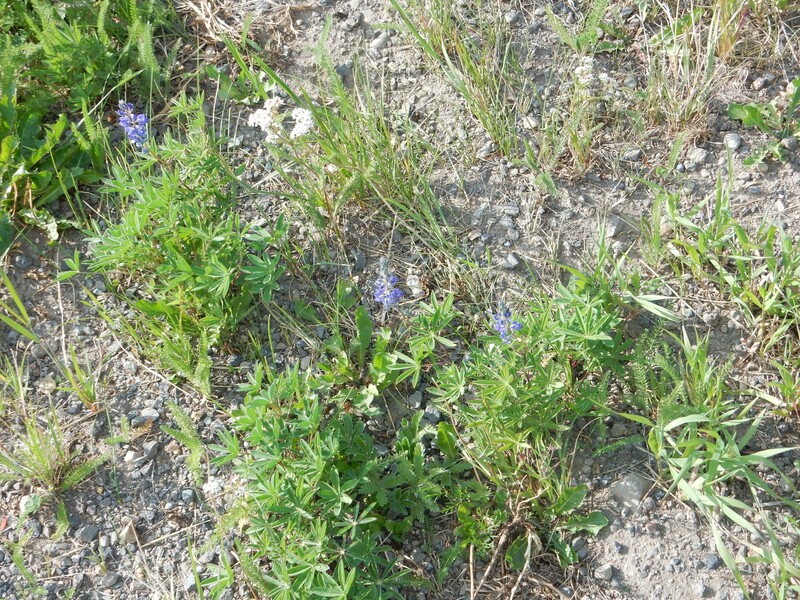 Faults can create paths to the surface, but they can also produce traps by blocking off a bed of permeable rock. Geologists with a knack for guessing where traps are located underground are much sought after in the oil business. 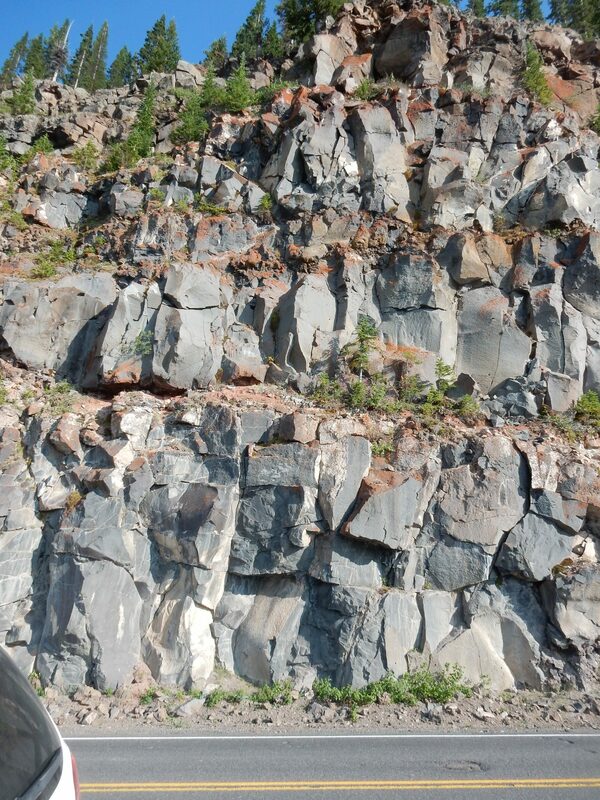 The Rangeley Oil Field is on the Rangeley Anticline, a natural trap, and the porous Weber Sandstone of Pennsylvanian to Permian age is the principle reservoir rock. 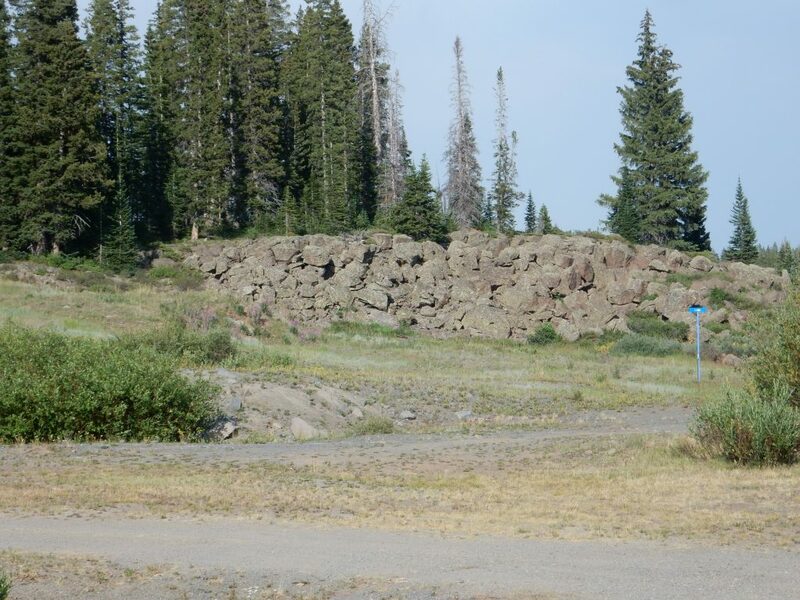 The overlying trap is apparently the Park City Formation, a dense limestone formation. There are a host of marine limestone formations deeper in the earth that could serve as source rocks. Nowhere in the basin are these beds exposed at the surface. 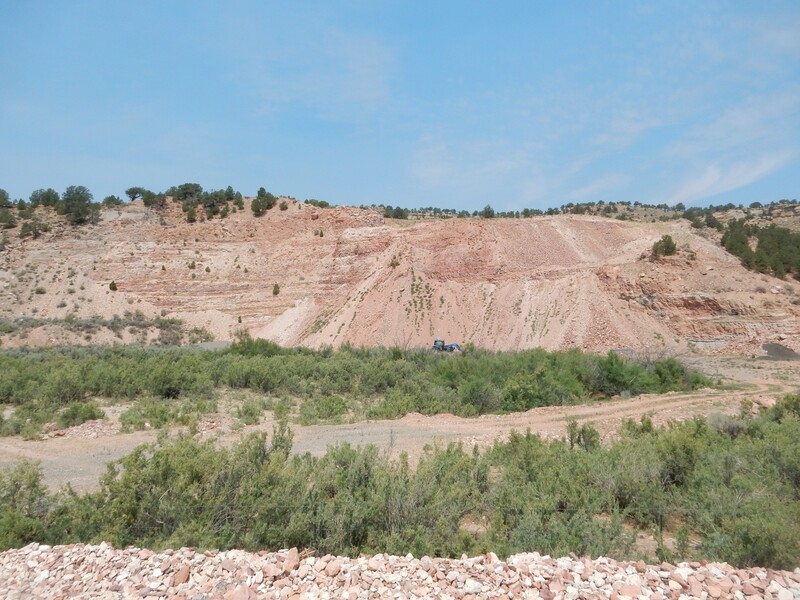 The surface geology here is all Mancos Shale with mesas capped by Mesaverde Group. As at the main facility. Evidently the fellow the cap belonged to didn’t make it. We keep our distance. We reach Rangeley, top off our fuel (and I check; my tire pressure is still okay) and head south towards Douglas Pass. 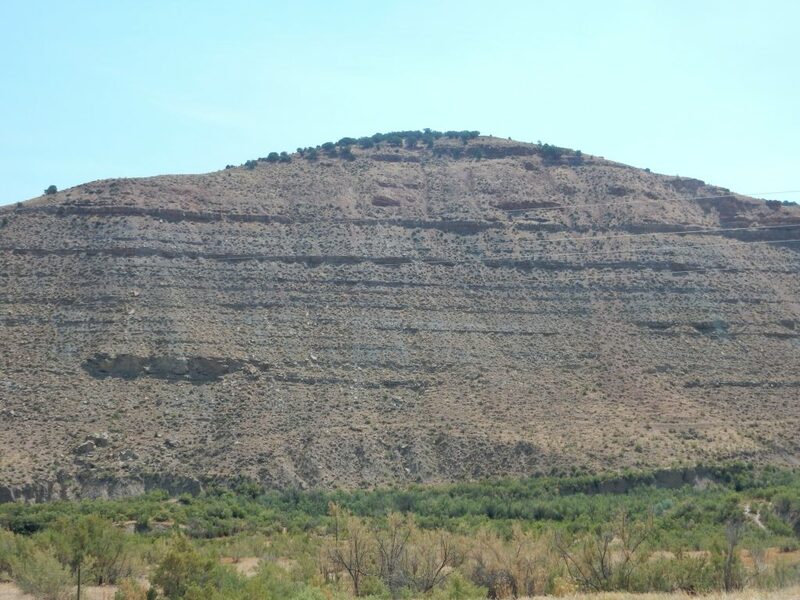 The mesa is identified in the geologic map for this quadrangle as the main body of the Mancos Shale, capped with Castlegate Sandstone of the Mesaverde Group. 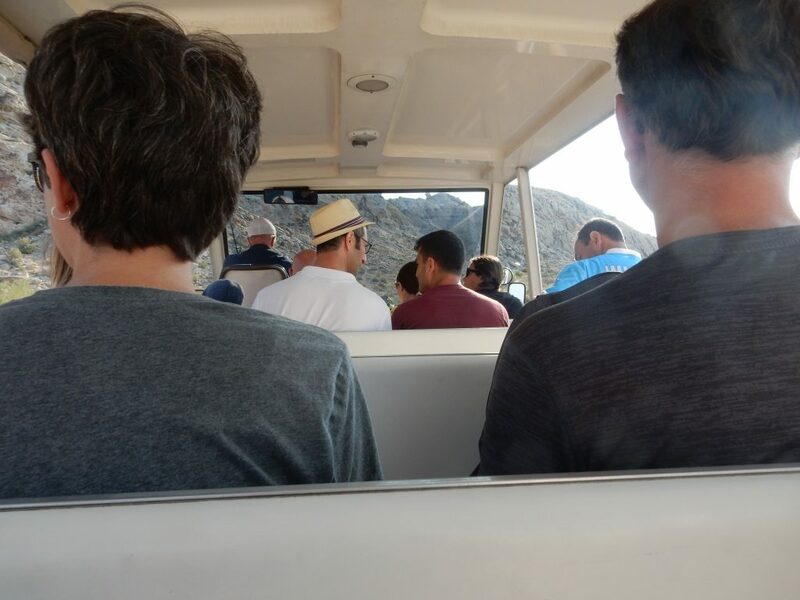 We continue down the canyon. I’m in the lead, and Bruce has lent me a road log, trusting me to pull over at interesting spots. Here is one. 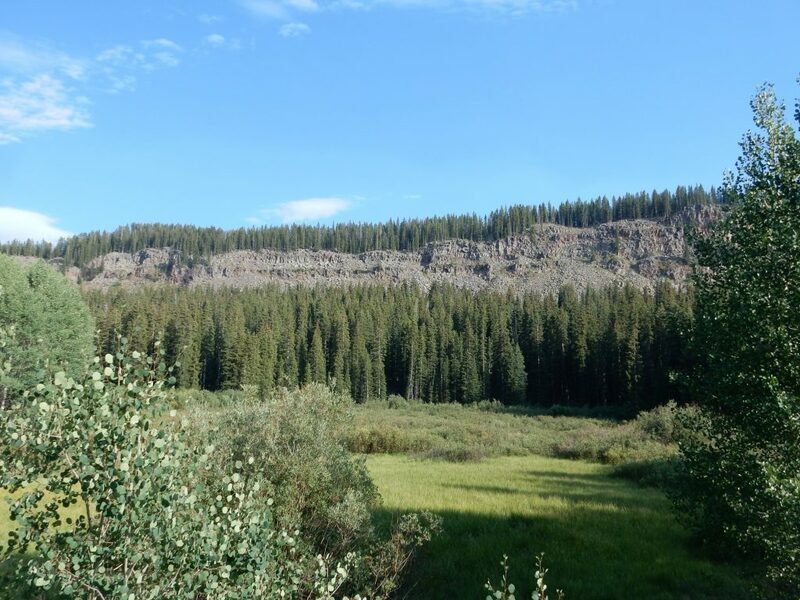 We’re looking east at a cliff of the Williams Fork Formation. This is part of the Mesaverde Group. The map shows different units east and west of Douglas Creek, but there is no fault mapped down the creek; I’m left wondering if this is a case where similar units at different locations that were assigned different names were mapped towards each other until ooop! they met more or less seamlessly, and geologists had to legislate a boundary. The light here is at the wrong angle to really bring out the neat thing about this outcrop. Let’s try another photograph. At about this time the local sheriff pulls up alongside us. “What’s going on here, fellas?” I turn around; my shirt says, in extremely loud letters, “JUST ONE MORE ROCK, I PROMISE.” Bruce is wearing a cap that has something along the lines of “Colorado Geological Survey.” When Bruce explains that we are enjoying the local geology, the sheriff believes us, wishes us well and warns us to be careful on the narrow roads, and moves on. Cindy was right about insisting I wear the shirt. See it now? 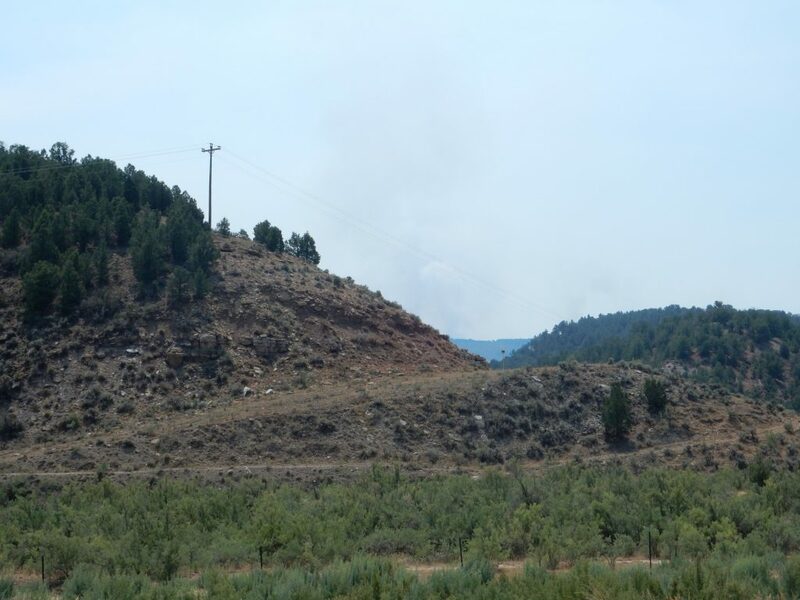 Yeah, I’m having a hard time seeing it, too, but it shows up clearly on satellite: The tops of the mesas have been burned red from in situ combustion of coal beds beneath. The Mesaverde Group is famous for its coal beds, and various natural processes — lightning strike, wildfire — can ignite the beds. When that happens, in the absence of human intervention, the beds can smolder for centuries. This is actually taking place today in parts of China and Australia. I don’t know when the fires here took place. I don’t know that geologists can estimate it well. Could be any time in the last few million years. 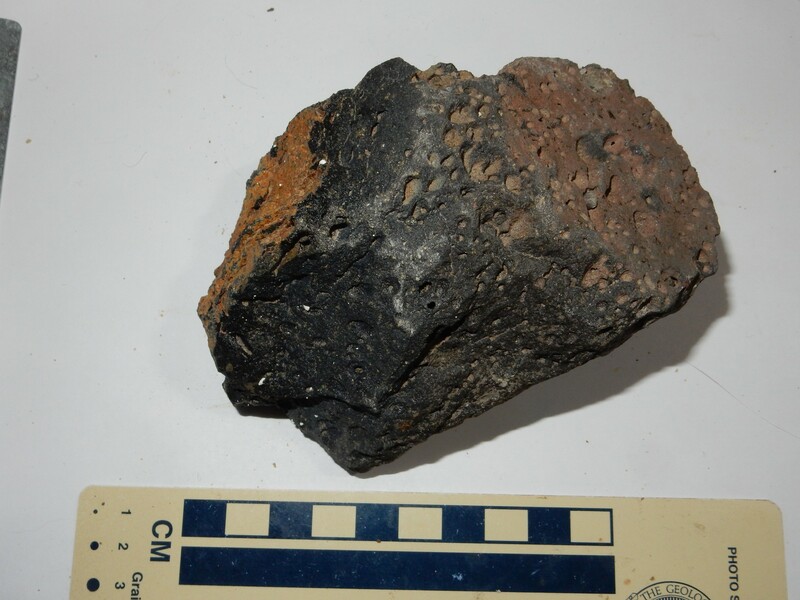 and the clinker is a little more obvious. I don’t think this is clinker. It looks like Nugget Sandstone. Bruce and I speculate fruitlessly about what local faulting might have brought it to the surface. Then we turn around and see a modern fire. Human males are intrinsically voyeurs, and we’re also pyromaniacs. We find a spot further down the road with a better view up the canyon. We had seen a helicopter with a fire bucket headed south earlier, and now we know why. (And we know it’s been reported already.) This is Red Rock Canyon. 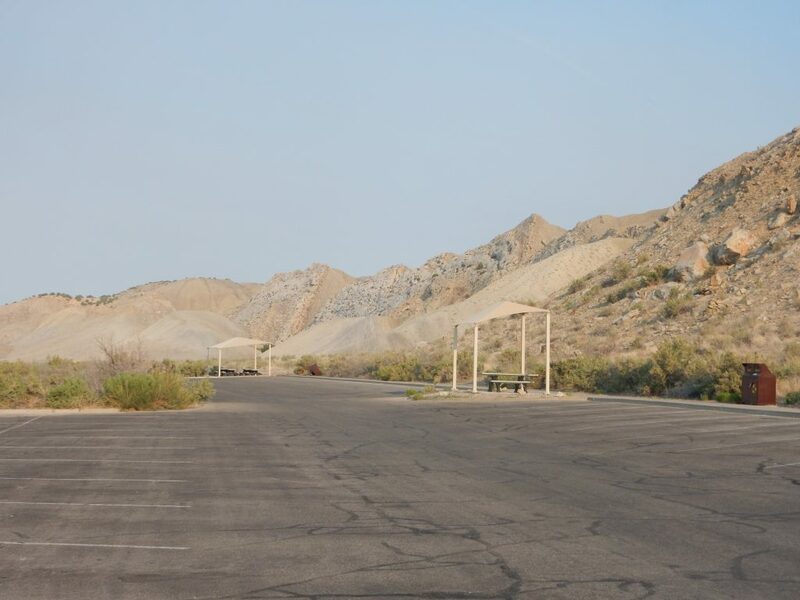 When I get home, I’ll google and find that, by astonishing coincidence, there is a Red Rock Canyon in Nevada and it’s also burning. There is no mention of this fire, which looks pretty small at this point, so I suppose (hope) they quickly contained it. 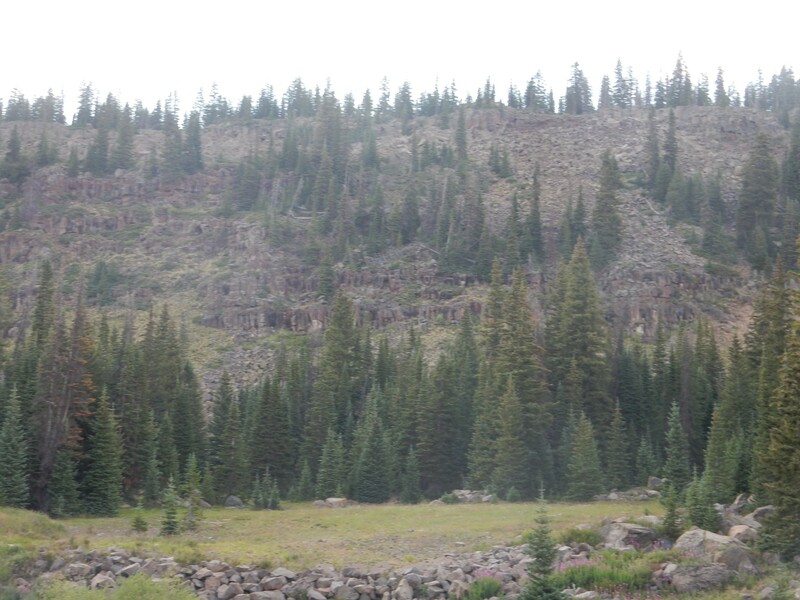 Through the binoculars, and to an extent through the telephoto lens here, you can see individual trees crowning. 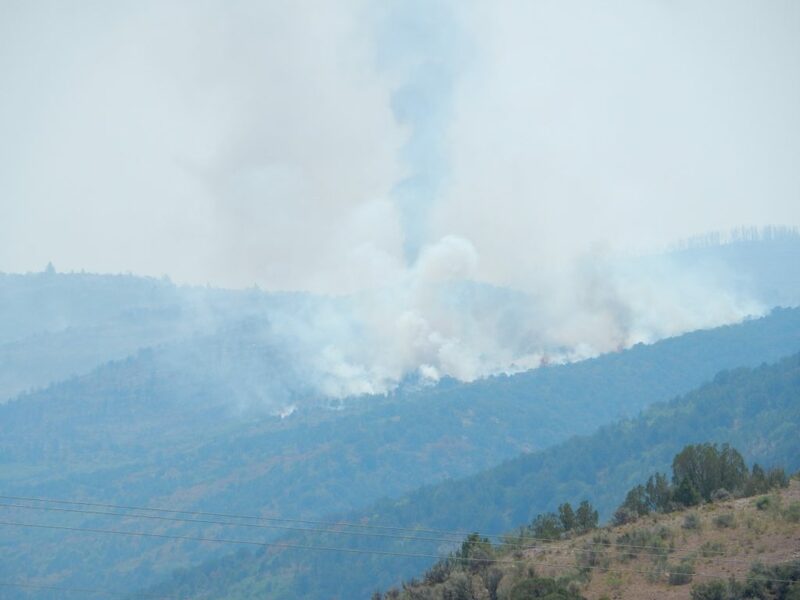 Fortunately the forest is not dense and the crowning fires do not spread catastrophically. 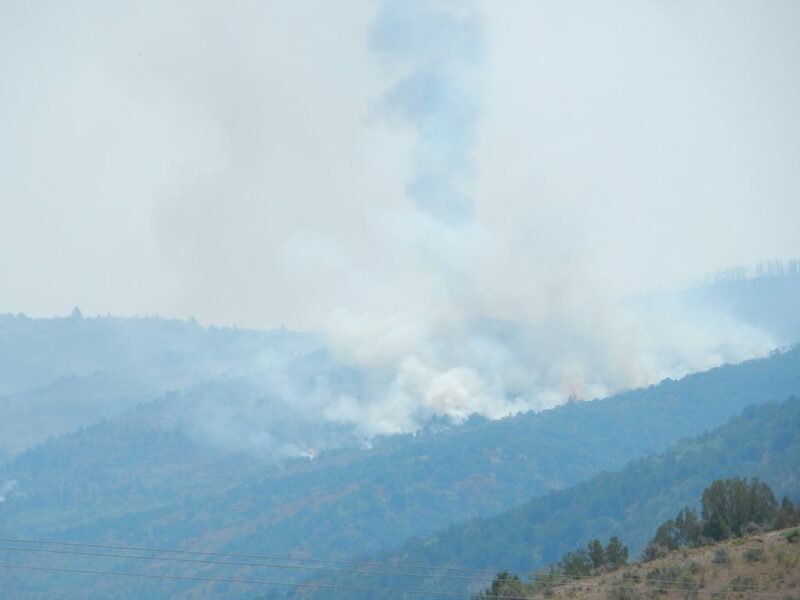 But, at this time, the fire is definitely growing and putting out more and more smoke. We will see at least three other fires in the area today; the upshot is that the air is so bad that I never will get out my big telescope on this trip. 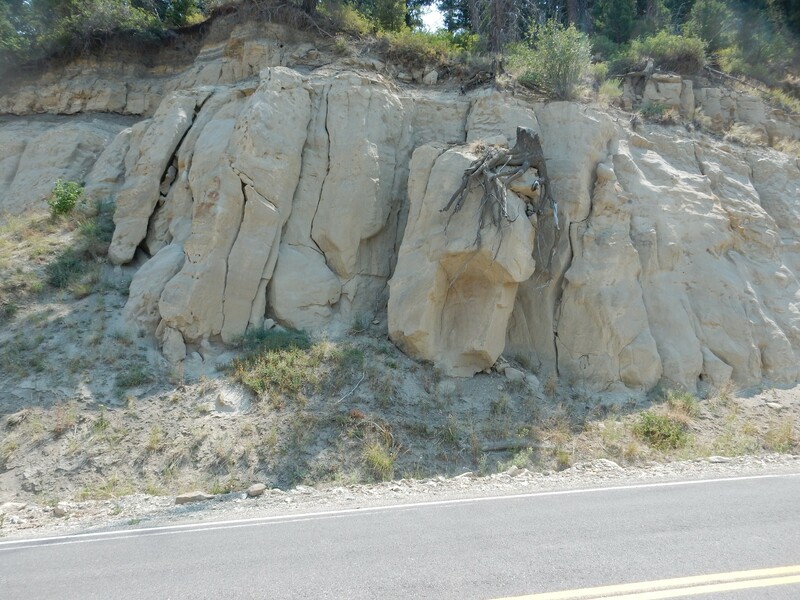 This is sandstone of the Tertiary Wasatch Formation. 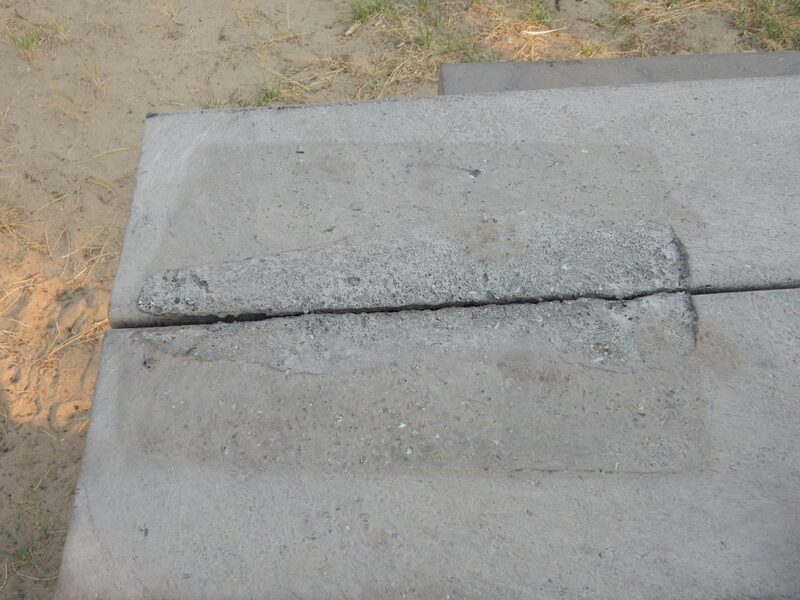 I get out and look; it turns out to be much better cemented that it appears. Bruce suggests it’s full of volcanic ash, judging from the appearance. 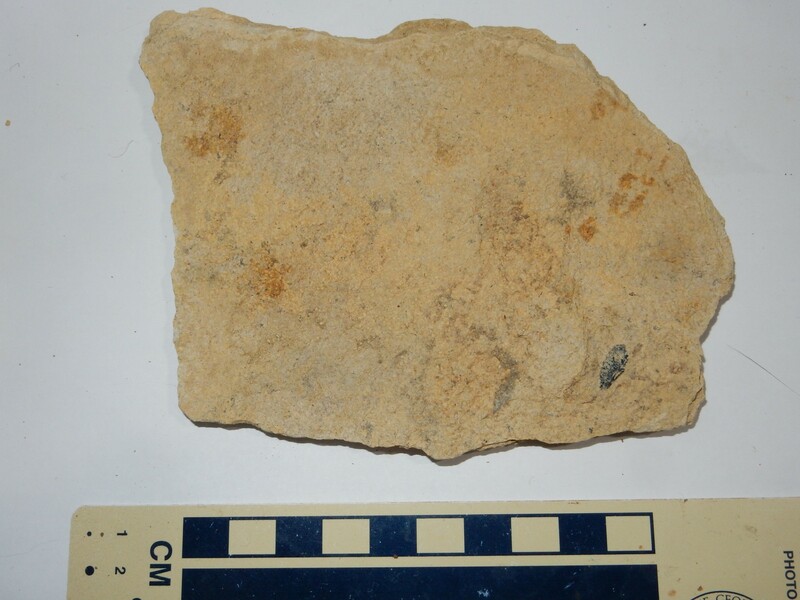 I look at a fragment; yep, it’s full of lithic clasts, tiny broken fragments of volcanic rock. Something was erupting enthusiastically upwind when this stuff was being laid down, apparently in the early Eocene, 50 million years ago. Across the canyon are spectacular cliffs. 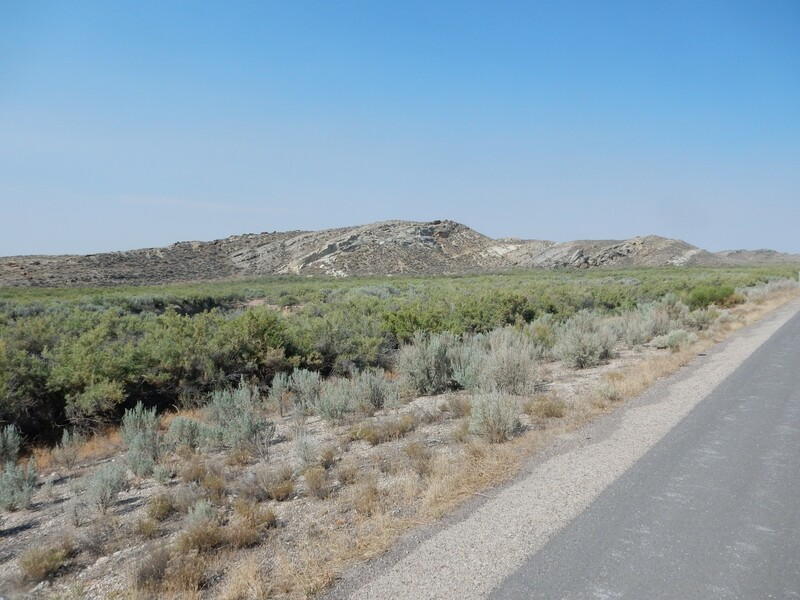 These are the Twin Buttes, for which I do not have a geologic map, but my guess is that this is the Douglas Creek Member of the Green River Formation, also Eocene in age. 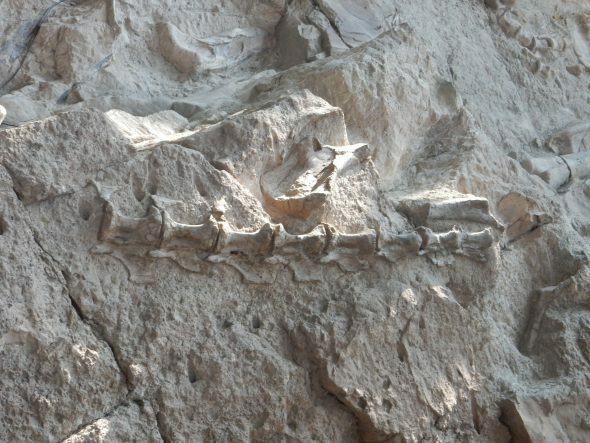 as lower Green River Formation. The geologic map agrees. 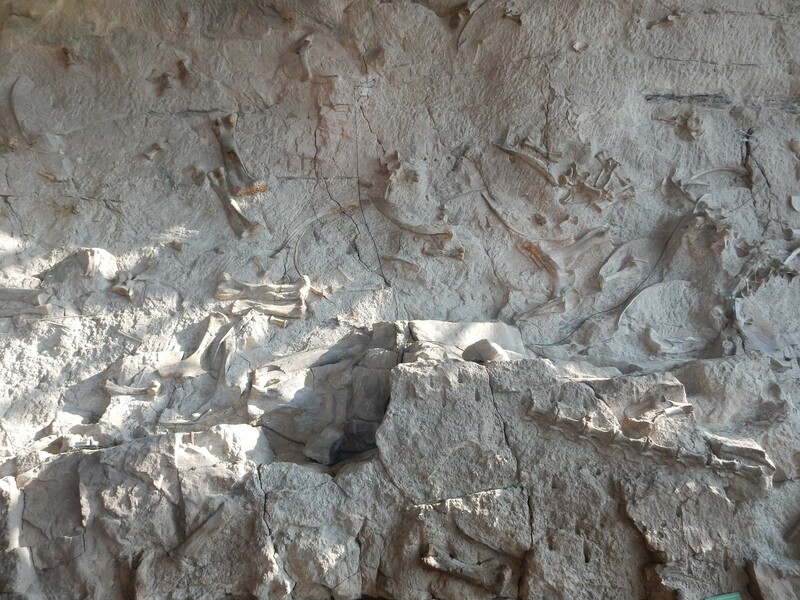 Bruce is puzzled; he’s used to Green River Formation being white limestone beds with lots of fish fossils. I’ve seen oucrops of shale in the formation, but always interbedded with white limestone. 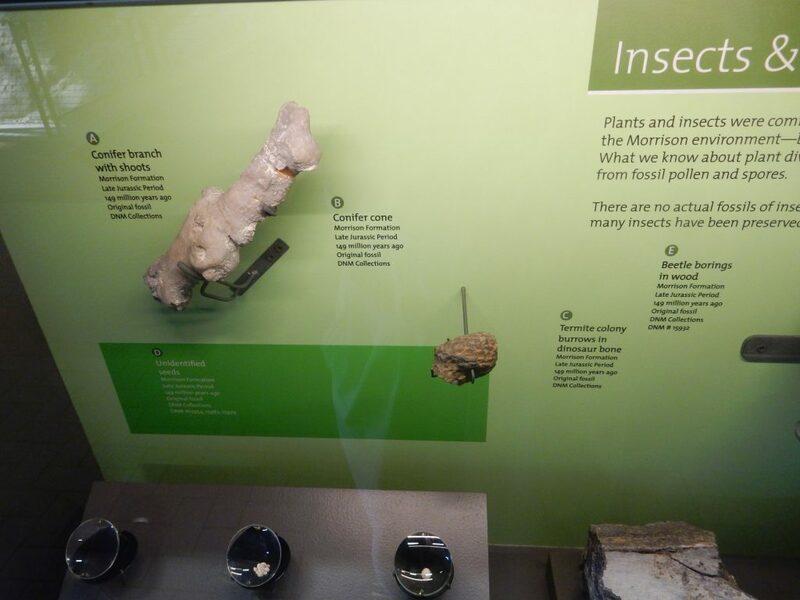 We hunt fossils, without much success; perhaps a bit of beetle carapace here and there. I keep one poor fossil. 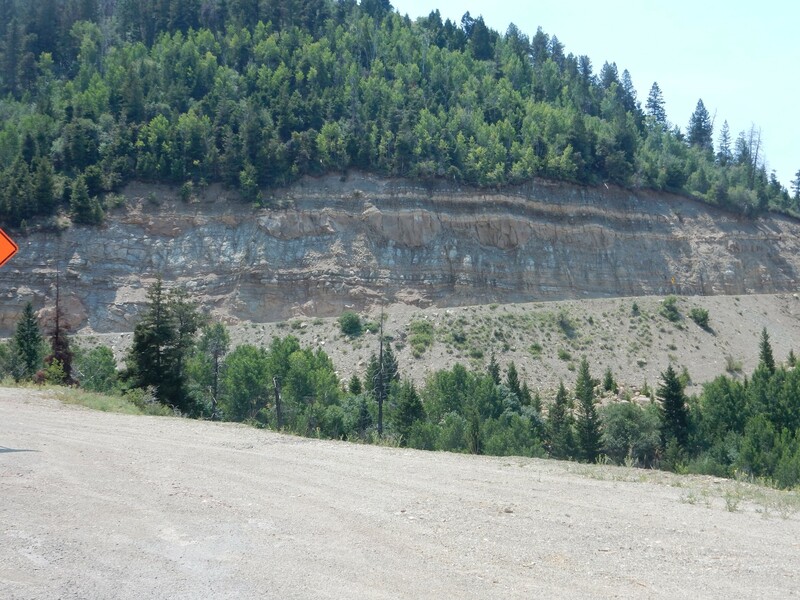 The Wasatch Formation is composed of sediments eroded off the young Rocky Mountains. The Green River Formation records a giant freshwater lake, comparable with one of the Great Lakes of today, formed south of the Uintas. We’re on the southeast margin of it here. Through the pass, and down the other side. 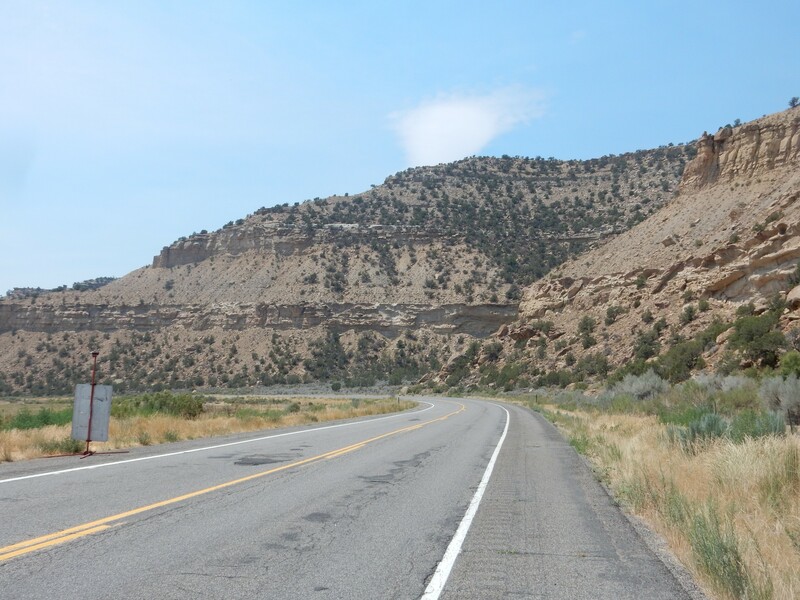 More Green River Formation, both here and across the canyon. I continue down the pass, coasting in low gear. Bruce is right behind. Eventually we come to new outcrops. I have no map for this area, and can’t even guess. has so got to be Mesaverde Group. We come out onto the Grand Valley. The distant highlands is the Uncompaghre Uplift. It’s an area that has repeatedly been thrust upwards by tectonic forces; once during the Pennsylvanian, as part of the Ancestral Rocky Mountains, 320 million years ago; and again as part of the Laramide Orogeny, peaking 60 million years ago. 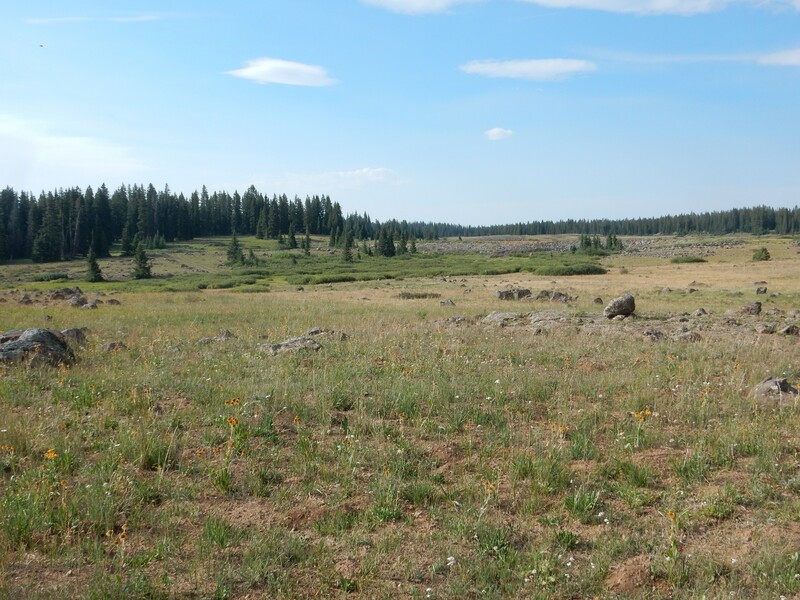 Sediments from the first uplift form many of the great formations of the Colorado Plateau, some of which extend down to the Jemez area. 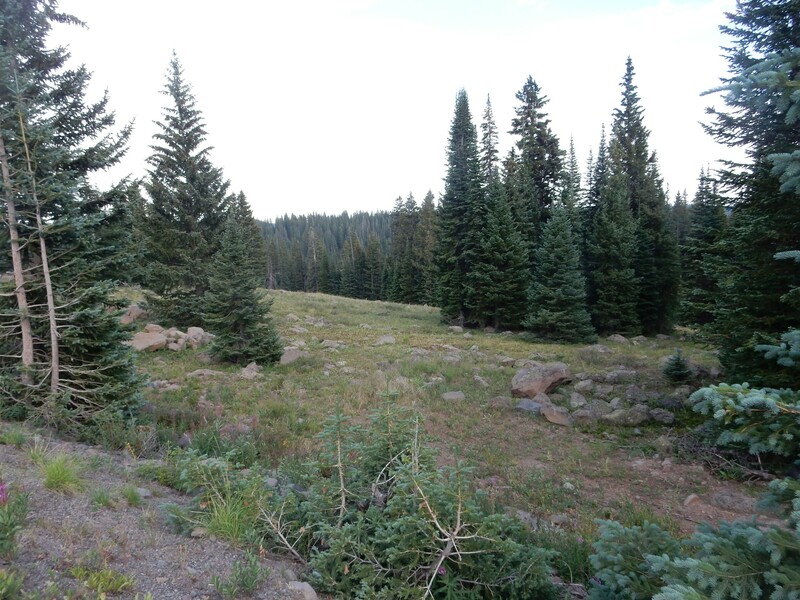 Headed now for Cederedge, where Bruce has his hotel reservations, and Grand Mesa, where I have a campsite reserved. 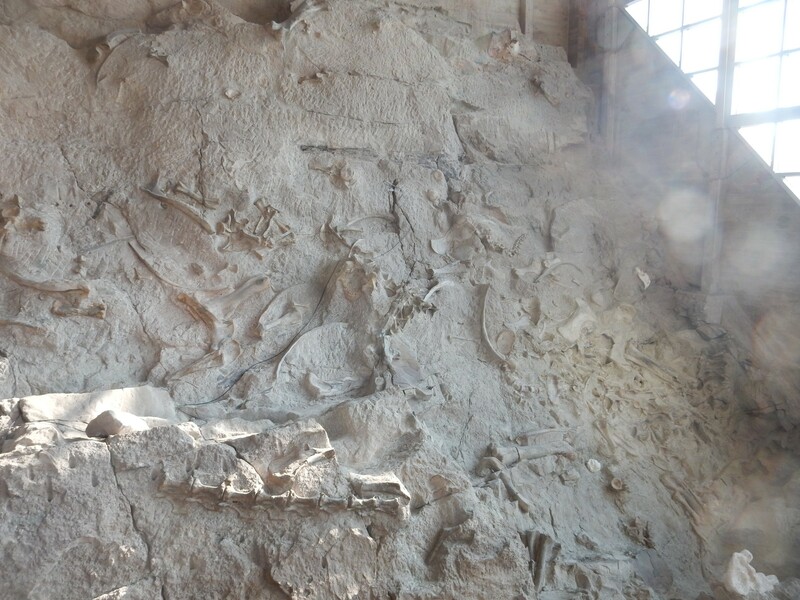 Bruce notes that there is a fossil quarry off the highway to Delta; we consider, then decide not to. We have some distance to go, not that much time, and the site location is not well described in the log. Grand Mesa seen from the highway to the west. 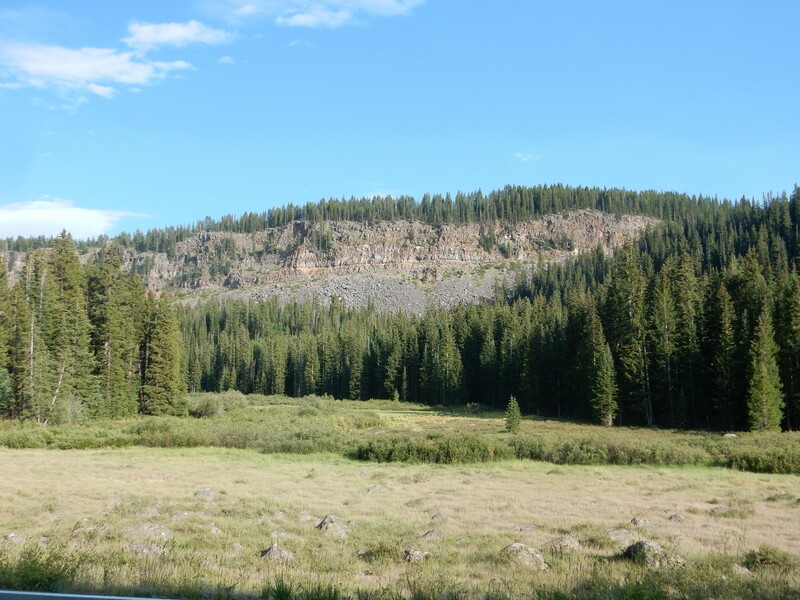 Grand Mesa is allegedly the largest flat-topped mountain in the world, with an area of 500 square miles. 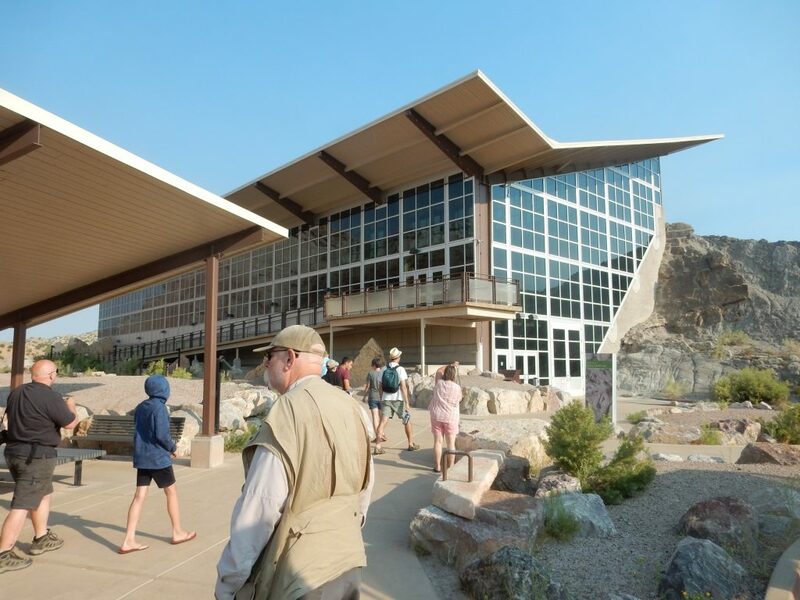 It’s capped with basalt flows ten million years old, which have preserved a great thickness of softer beds beneath that were eroded off the surrounding areas. The highway has been paralleling a ridge in the Mancos Shale. Alas, my GPS crapped out here. 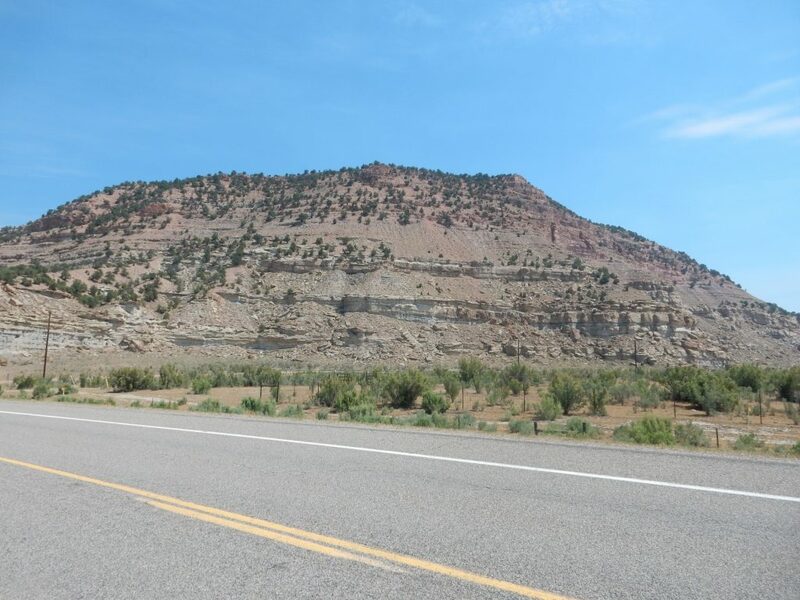 But it’s a very good guess, based on the geologic map for roughly this area, that the ridge is Blue Hill Member of the Mancos Formation, capped with calciferous shale of the Juana Lopez Member. The calciferous shale is more resistant to erosion and so has produced his ridge. 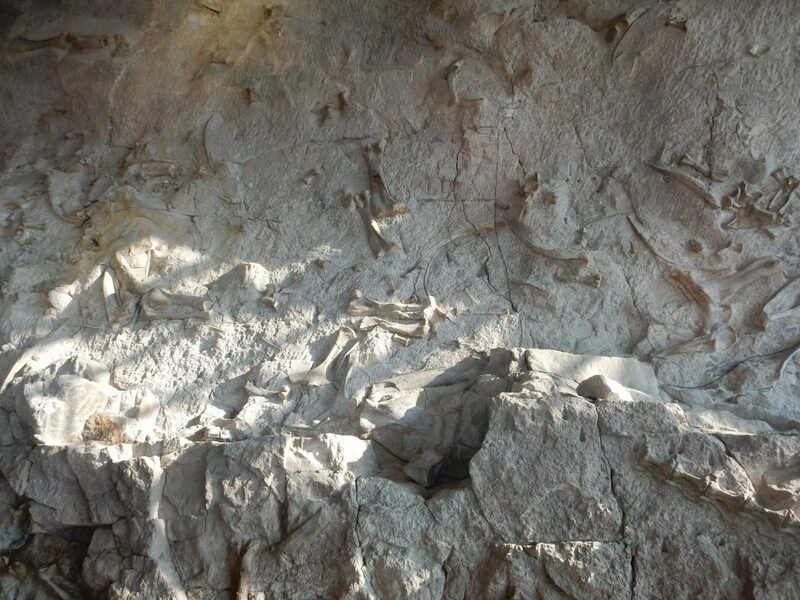 Juana Lopez Member is found back home, where it tends to contain Inoceramus (saber-toothed oysters) and ammonite fossils. We come to a road cut. Alas, we’re back in a quadrangle for which I have no map, but that has to be Mancos Shale. The dark “beds” are an erosion control net stretched across the road cut. There is a canyon in the other direction. This is likely carved into the Mesaverde Group. Close up of the road cut. 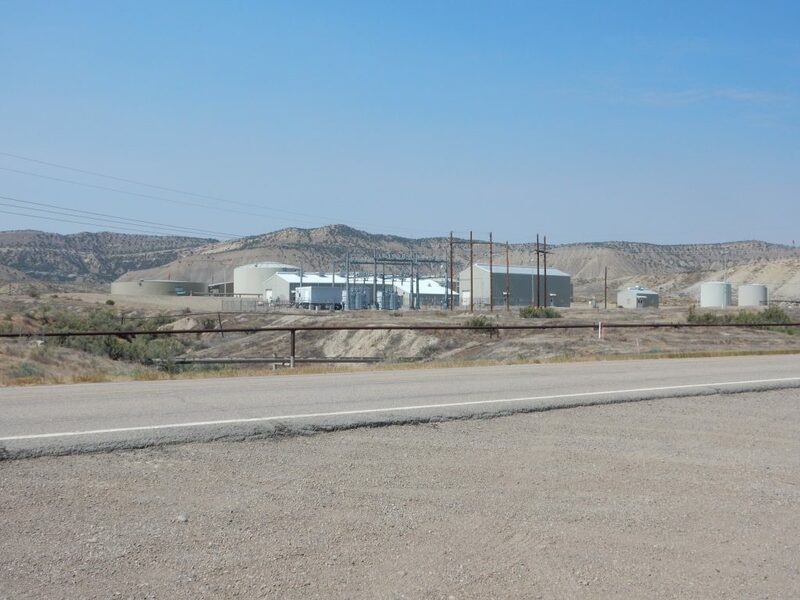 Seen from this side, I’m less sure it’s Mancos Shale. It looke like it might be upper Mesaverde Group. 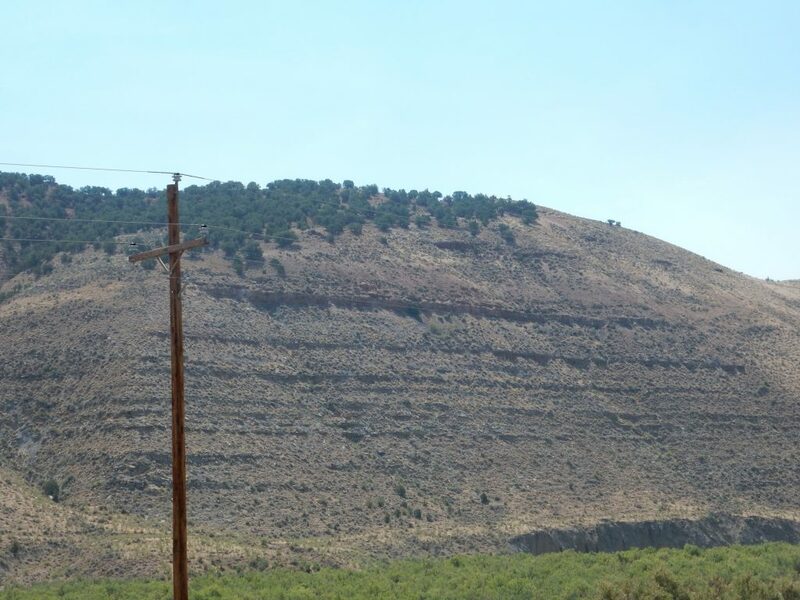 The hills are Mancos Shale capped with old river gravel rich in basalt fragments. Bruce is now in the lead, looking for a Wells Fargo. 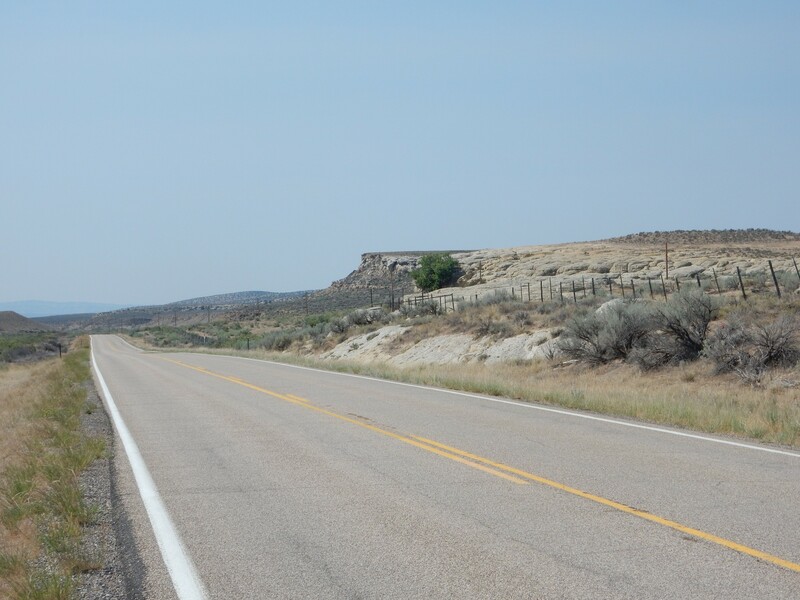 We pass through Delta without spotting one, then turn onto the highway to Gunnison and take the road north towards Cedaredge. I pull over when I spot this. 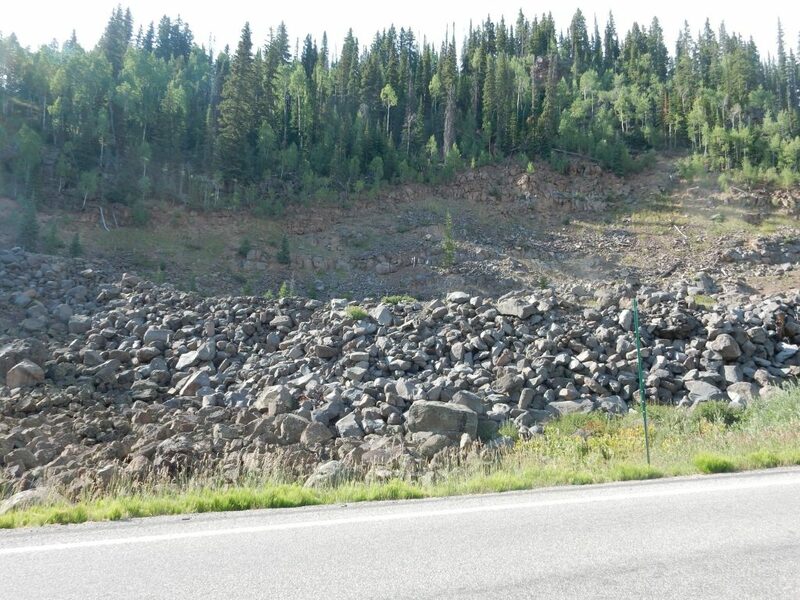 The geologic map describes this as Quaternary mixed debris flows and gravel deposits. It’s a dead ringer for the Puye Formation back home, which is debris flows, lahars, and ash beds from the Jemez Mountains. We examine this for a while, noting that there are indications of some coarsening upwards sequences typical of debris flows. 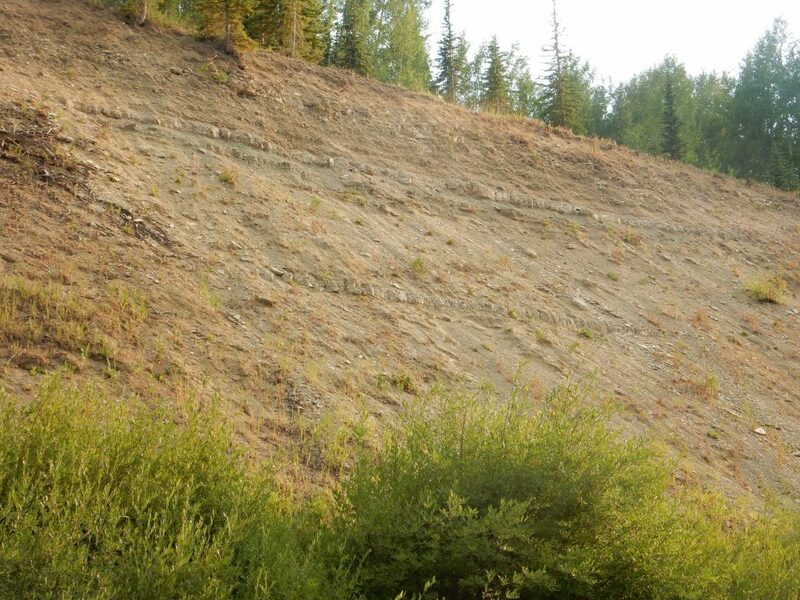 A bed is said to coarsen upwards when the individual grains become larger towards the top of the bed; it’s fairly typical of lahars and debris flows, where the larger boulders “float” on the finer material in the flow. We get to Cedaredge and Bruce checks into his hotel. 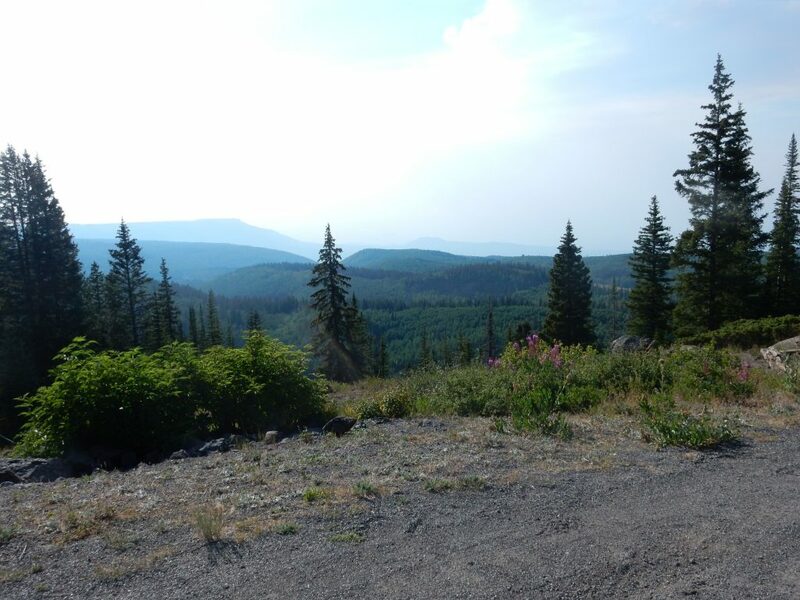 We then pile into my car and drive up to Grand Mesa, following another road log. There are some glacier features here, such as this small lake. Bruce spots the beaver lodge. 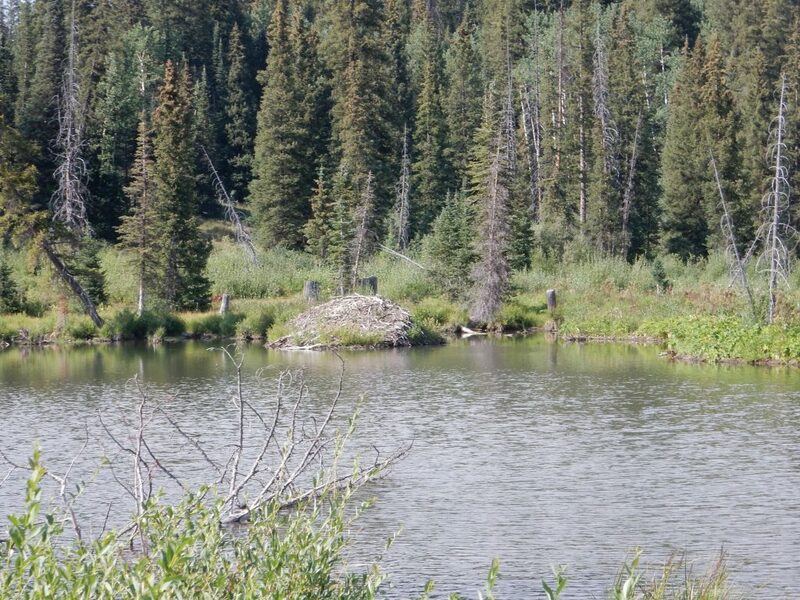 I do not see any chewed trees, but Bruce points out that beavers are particularly fond of aspen and there is an aspen grove on the hill to the east. We pass a rock slide, behind which are basalt cliffs. 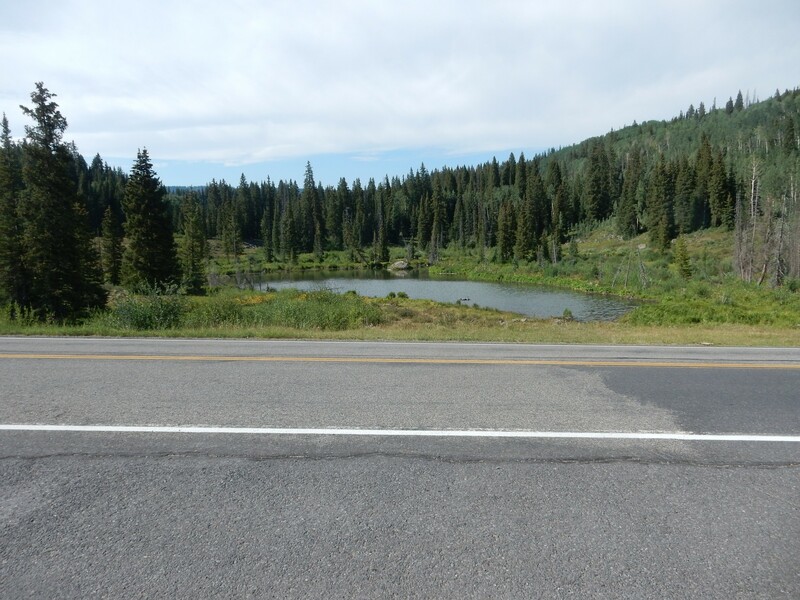 It turns out I have no geologic map for Grand Mesa; everything I say here is going to have to be based on my recollections of the road log. We pull into the trail head for Crag Crest Trail. The light is making panoramas difficult. It does not help that there is heavy overcast from wildfire smoke. 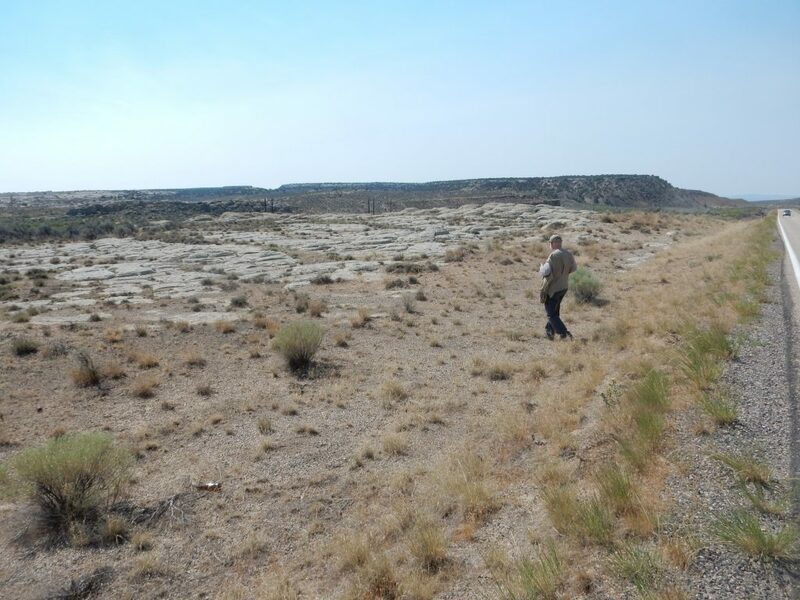 But the ground we’re standing on is the top of a toreva block, where part of the edge of the mesa broke loose as a solid block and slid partway down the side of the mesa. Many good examples exist back home, but not as large as this one. The cliff is the basalt capping the mesa where the block broke loose. A closer shot of the cliffs. Further down the road, through the trees, we see the other side of the toreva block. It turns out there’s a quite substantial lake down in the hollow, but I couldn’t find a good spot to safely park and photograph it. Another deep view of the basalt cap of the mesa. A fairly lousy picture, due to the failing light and the heavy smoke, but you can see that the cap is made up of many individual basalt flows. Onto the top of the top of the mesa. You can see that the top of hte mesa is indeed very level. It’s beautiful. Bruce and I get out and walk around a little. Next stop is an old quarry. Boulder field framed by alpine flowers. We walk south a short distance and examine the fen. 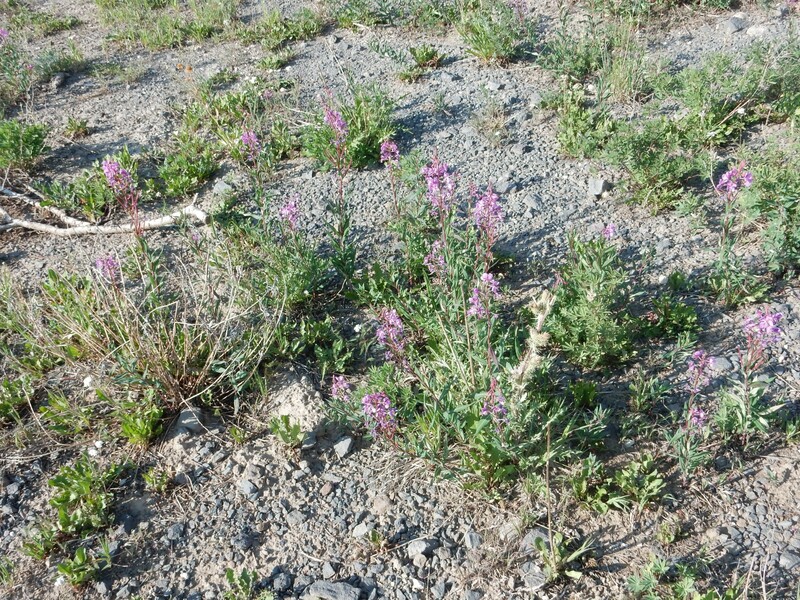 More wildflowers in the area. The sky is rather overcast with smoke. This somewhat spoils what would be a wonderful panorama. 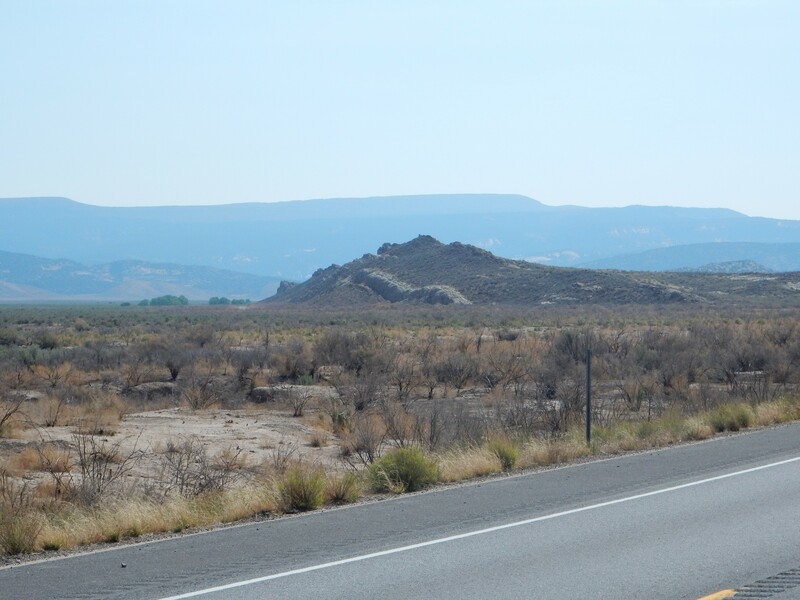 The mountains at right are Battlement Mesa. There is yet another fire burning there. 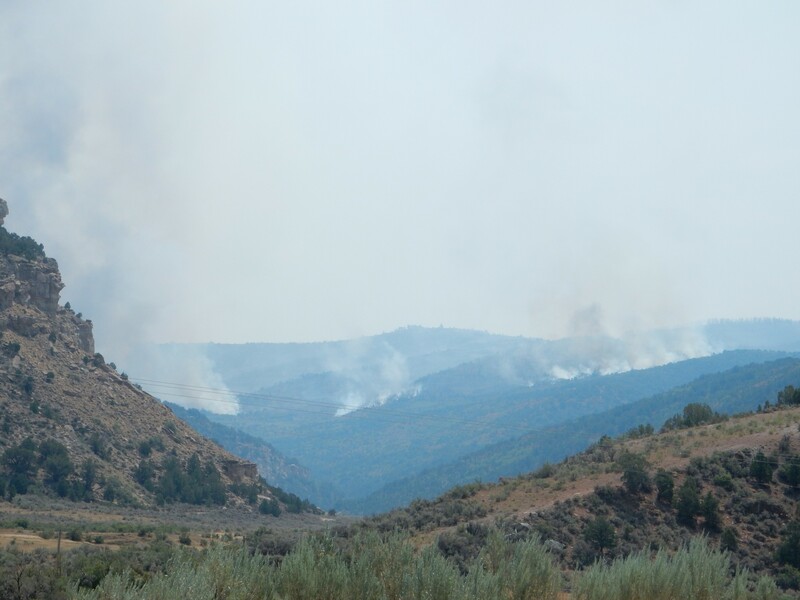 I don’t see an obvious pall of smoke from the fire we saw in Red Canyon, but it could be lost in the glare. Had the air been clear, we could have seen clear to the Book Cliffs and the Uncompaghre Uplift. The hill at left is the end of a toreva block. There are several others in this area. The road cut exposes fresh basalt. You can see several layers separated by paleosols, fossil soil layers, that were each baked by a subsequent flow. I walk up the road to where I can examine the red layer, and confirm that it’s baked brick hard. I also grab samples. Some of the void spaces are still iridescent. The loupe shows occasional grains of olivine; an olivine basalt. The olivine grains are pristine, not oxidized to iddingsite, remarkable in a 10-million-year-old basalt. But then the road cut here was blasted pretty deep. A look back at the escarpment. The red line looks like the road cut. 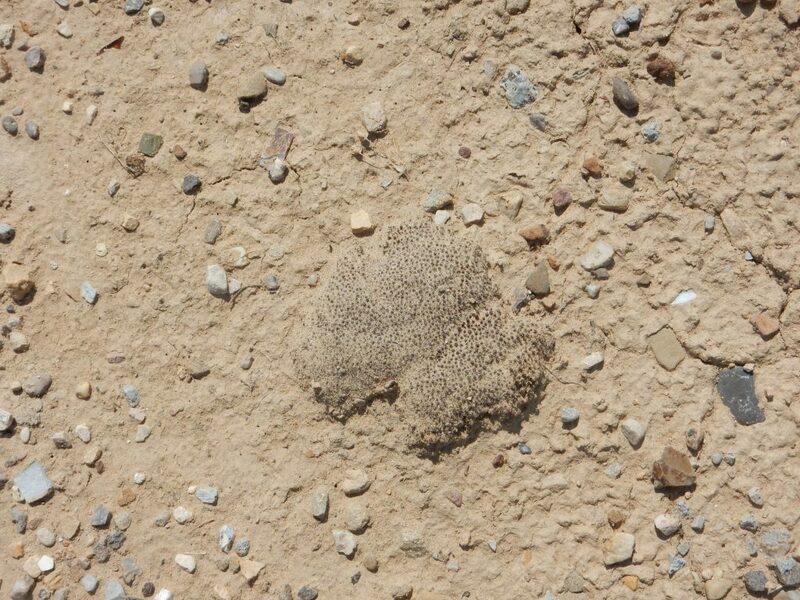 But after I get home, I’ll zoom up the picture and see that it’s a very thick paleosol between basalt flows. We’re below the level of the basalt escarpment, in the soft sedimentary beds beneath. These have a tendency to slowly creep downslope. The soil does not flow uniformly; the upper layers flow faster than the lower layers. 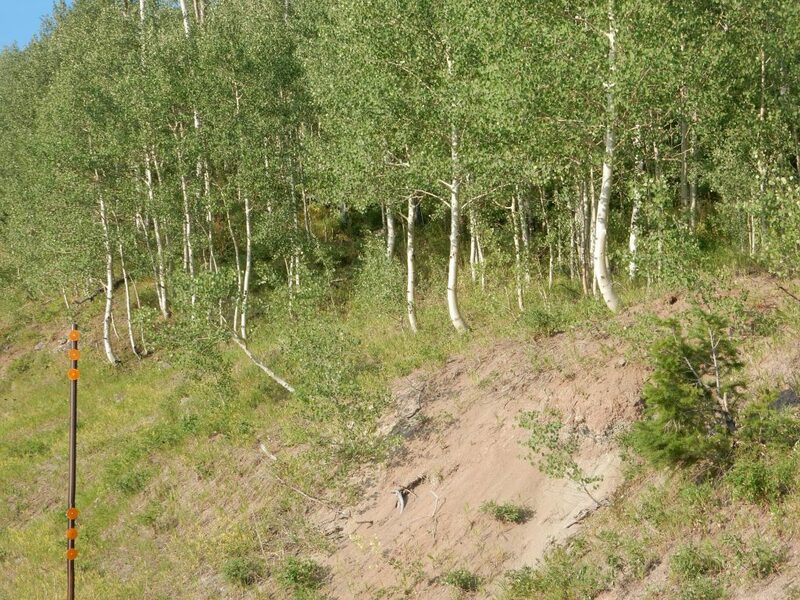 This introduces shear, which tends to rotate trees away from the slope. The tree naturally wants to grow straight up, and the result is the strikingly bent trunks here. 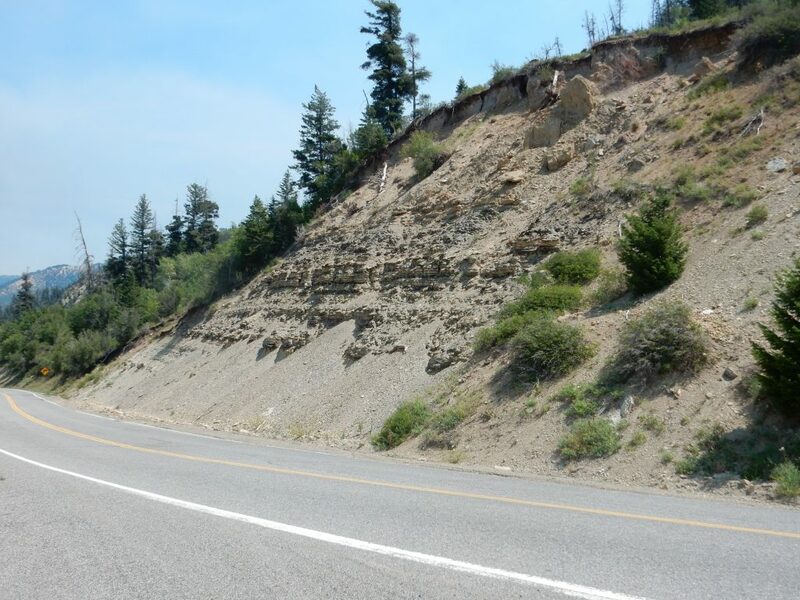 You also find “arcuate fractures” in the road bed, fractures curved towards the downslope side, which make maintaining these roads a never-ending chore. 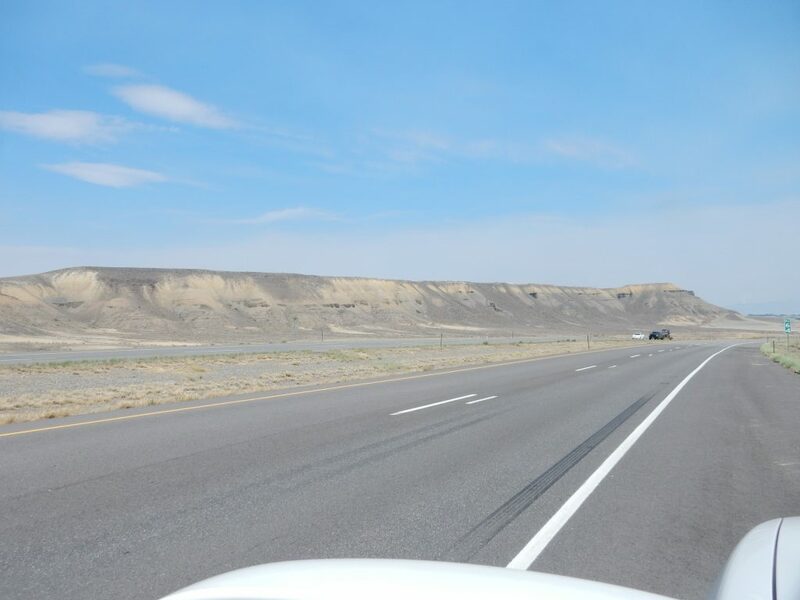 I don’t remember which formation the road log gave for these beds; Green River or Wasatch? I’m going to guess Wasatch because the beds more closely match the few Wasatch exposures I’ve seen before than the few Green River exposures I’ve seen before. We are on our way back, and I note the location of my campground. (Incorrectly.) We get back to Cedaredge and find a cafe. The waitress is personable and earns a better tip that the food deserves. I drop Bruce off at his hotel and drive back through the dark to my campground. Except the road that I thought was the turn to my camp goes nowhere; I go back to the private lodge nearby, which I thought was next to my camp, and ask. 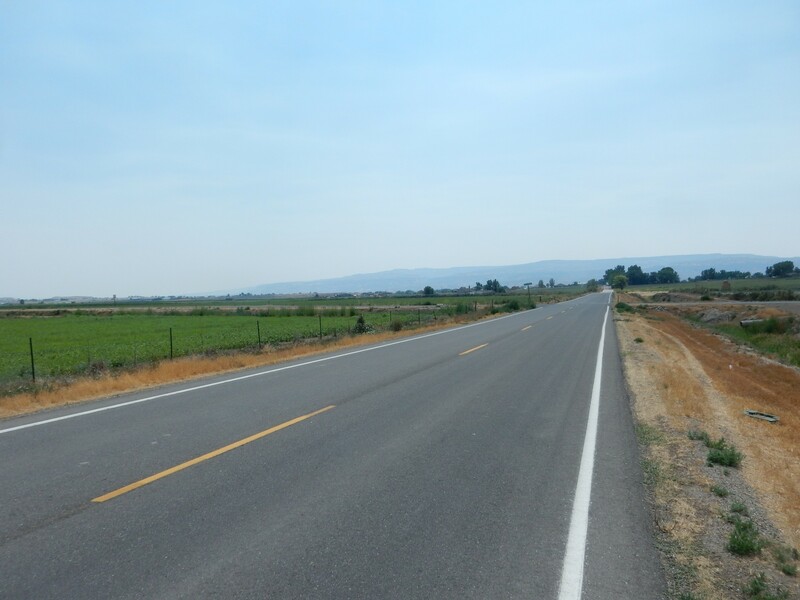 Eight miles down the road. Well then. It turns out there are two private lodges on this road and my campground is next to the second one. Then I can’t find my site. The reservation seems to say loop 2, site 26, but there’s only one loop and it only has 24 sites. I finally figure out it’s site 2 and who knows what the 26 means. I park and set up my tent in the dark; there’s enough overcast that I figure I better set up the fly as well, which proves a hassle; the stake cords are all knotted together. Shucks and other comments. I am awake again at 4:00 to find the air mattress has bottomed out again. I take a leak of my own and refill the air mattress. Otherwise, it’s not a bad night of sleep; it’s cool up here and that makes the sleeping bag cozy.